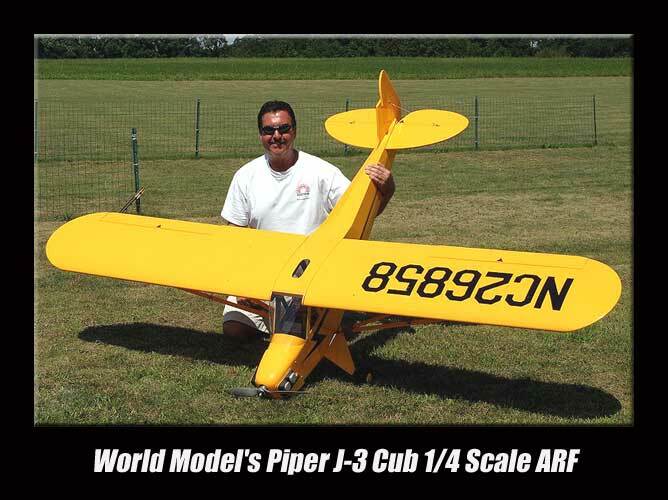 The World Model’s Piper J-3 Cub 1/4 Scale ARF is the most popular 1/4 scale ARF model on the market. In this review, I’ll be converting it to clean and quiet electric power. 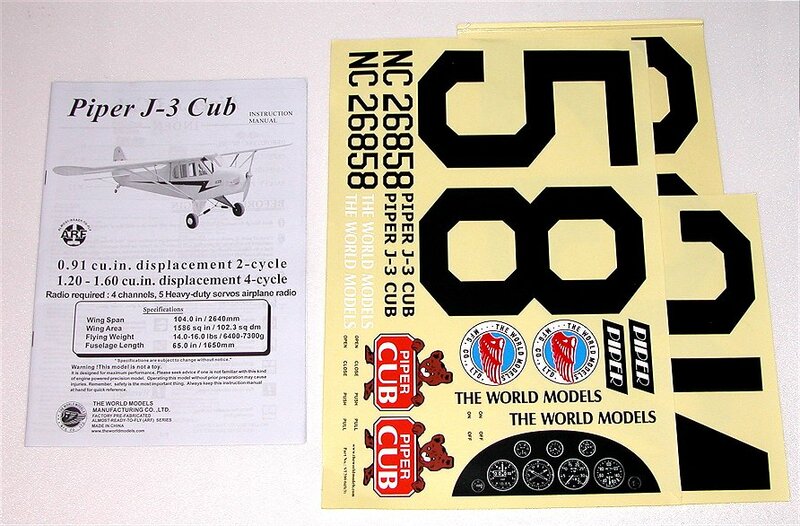 The J3 Cub and spare parts are available on-line at Airborne Models. 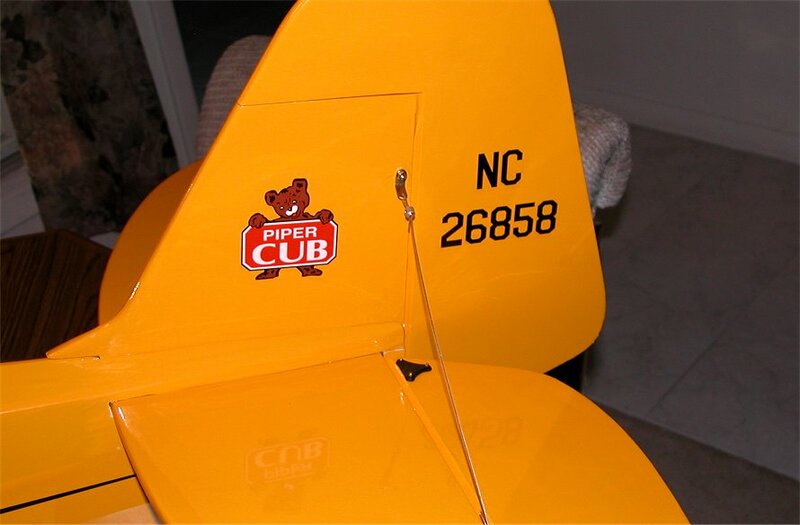 There are plenty of parts in the box to replicate all the scale features of the popular Cub design. 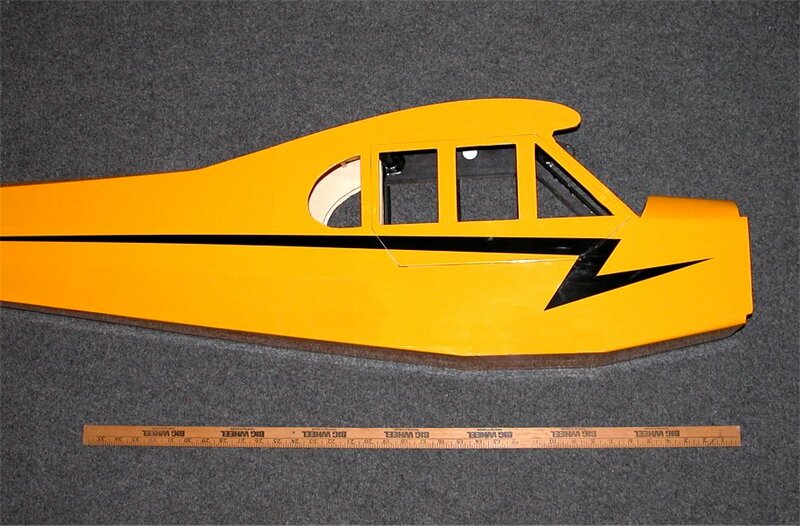 Although the fuselage comes with decals already applied, the wing and tail sections are left for the builder to customize. 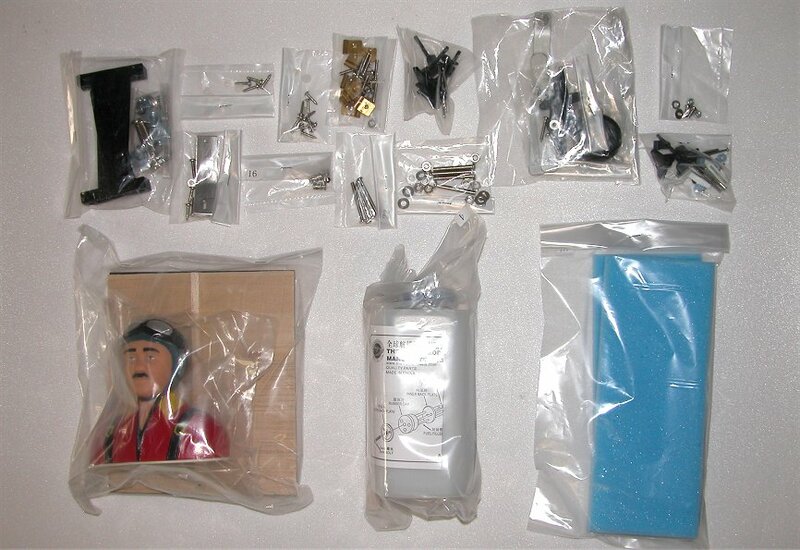 The kit includes all the hardware and linkage pieces as well as a pre-painted pilot. Each plastic bag is labeled with a number that matches the step in the instruction manual. 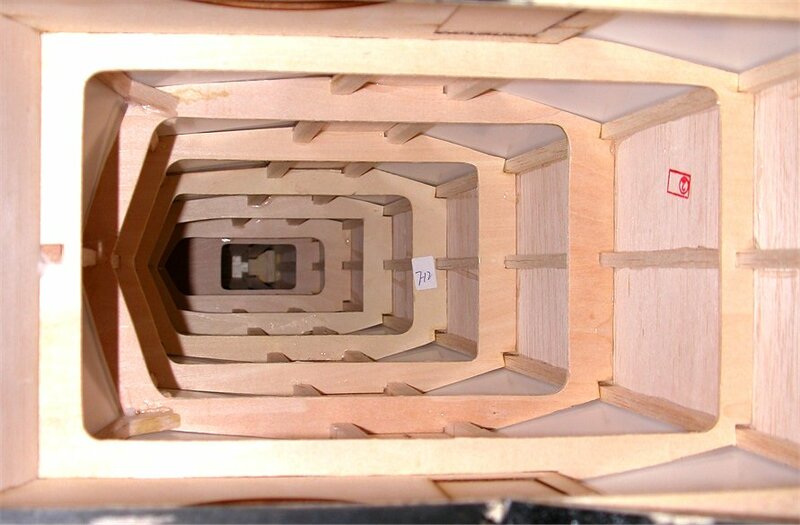 The stabilizer sections are pre-stripped for immediate gluing. 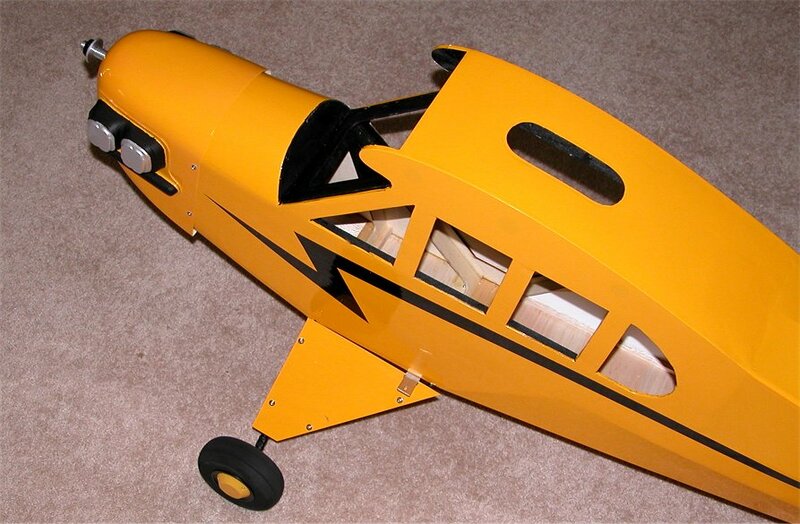 A closer look at the fuselage reveals quality construction and a big side door hatch for easy access inside. 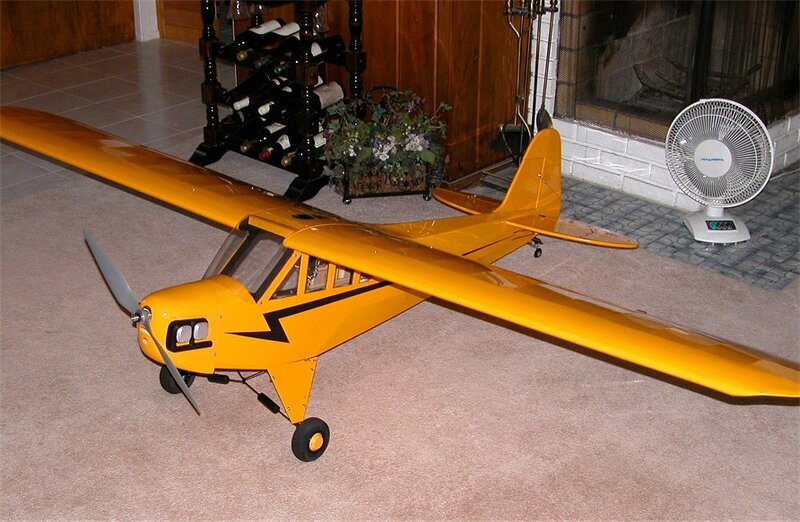 To power my 16lb J3 Cub, I’m using the AXI 5320/28/Jeti 90 Combo for only $408 at Hobby Lobby. This cost effective combination comes with two prop adapters for flexible mounting and can provide burst power over 2000 watts. 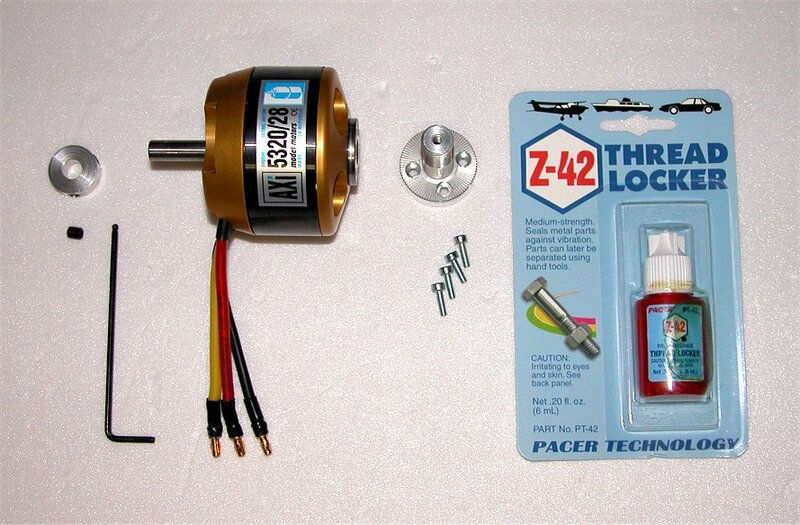 When installing the prop adapter and collar, I used Pacer Z-42 Thread Locker to keep the screws and hex nut secure. 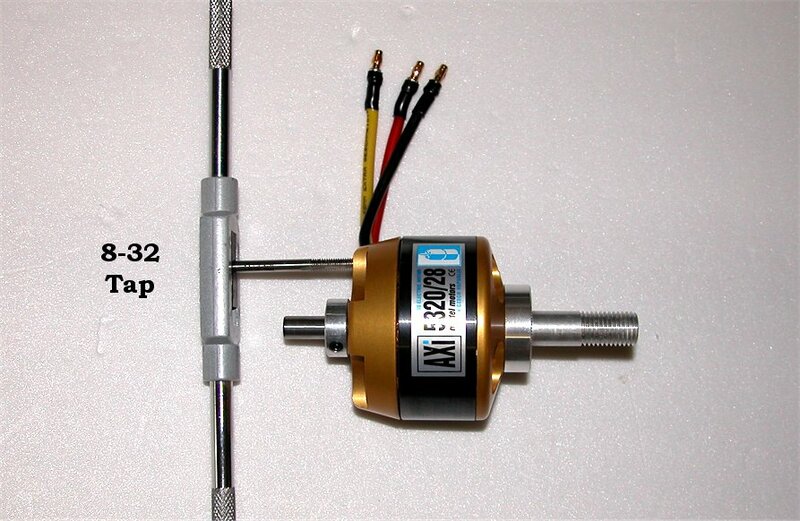 To mount the AXI 5320/28 motor using the nylon spacers and 8-32 hardware from Hobby Lobby, I needed to re-tap the metric mounting holes on the motor for 8-32. 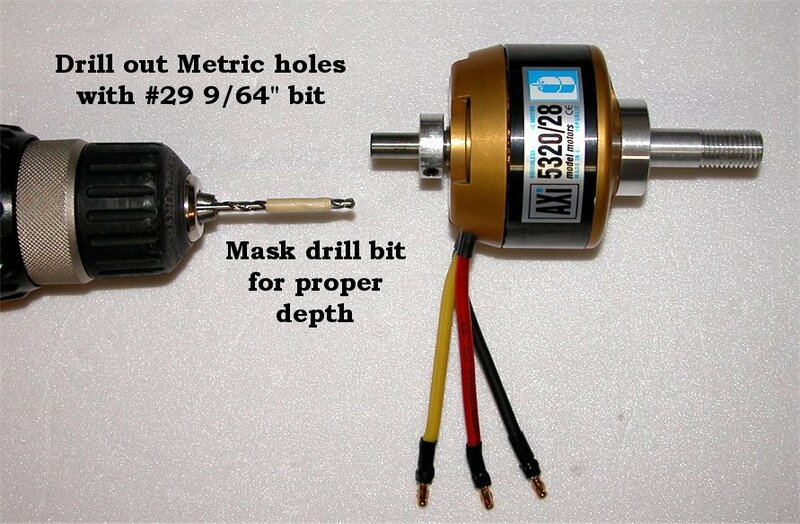 This was quite easy since it is the next size up from the M4 threaded holes on the motor. I did both the drilling and tapping underneith the motor so that any fragments would drop down. That end of the motor is wide open so it is easy to blow out the metal dust by mouth or compressed air. 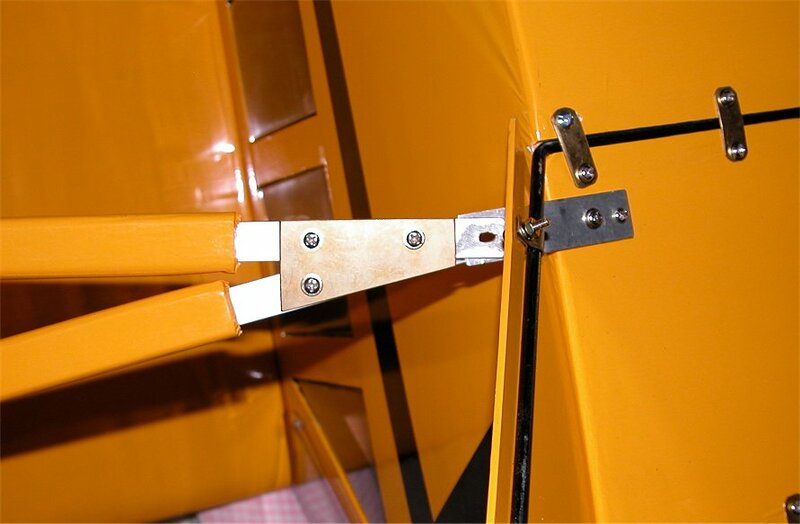 Due to the outrunner design and laminated wires, I doubt that any escaping metal pieces would cause harm. 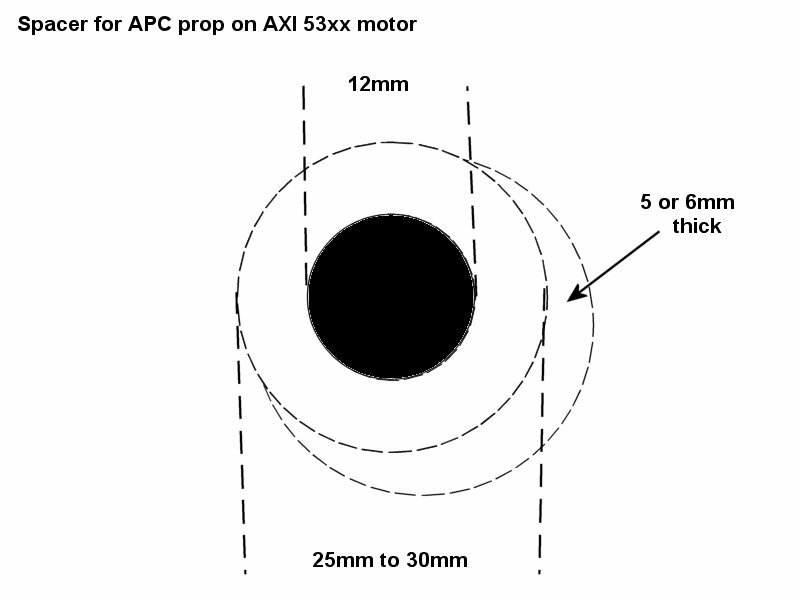 That being said, the procedure likely voids the AXI warranty, in which case long M4 screws could be used. 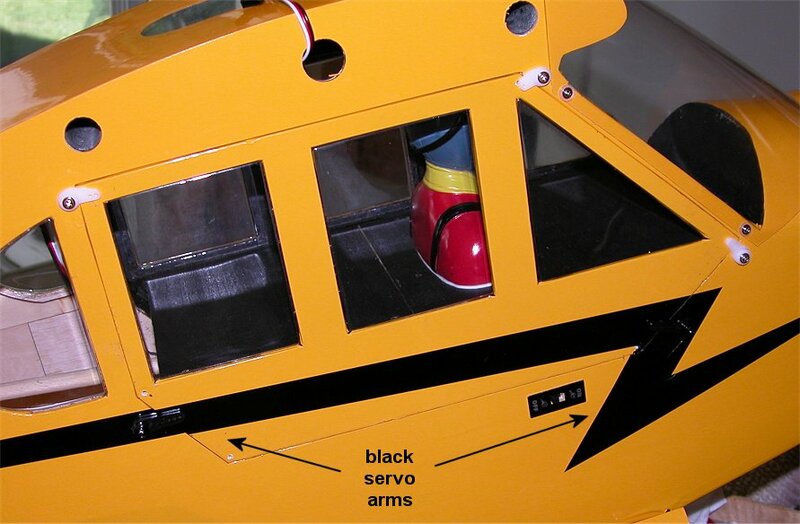 Next, the included AXI motor mounting decal was applied to the pre-drawn crossed lines on the ARF model. 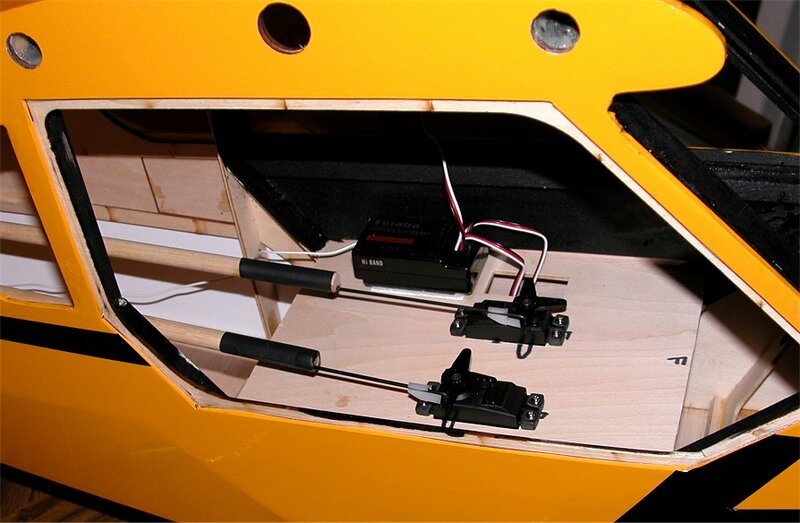 The lines are pre-drawn for centering the glow engine shaft through the cowl opening so they also work perfectly for a direct drive electric motor. 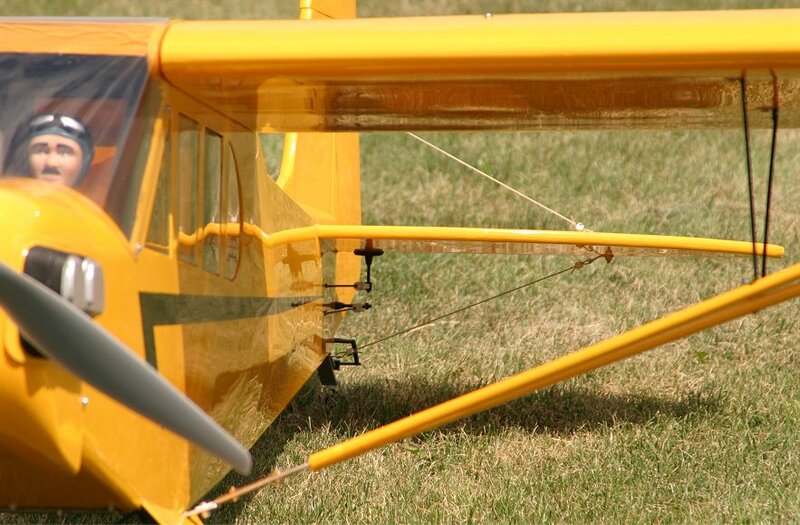 The nylon spacers create the proper offset of 2-3/4″ inches needed for prop clearance by using two 1″ spacer, one 1/2″ spacer, and one 1/4″ spacer. Since the 4″ 8/32 screws are a bit long, I used one 1/2″ spacer behind the almost 1/2″ thick firewall. 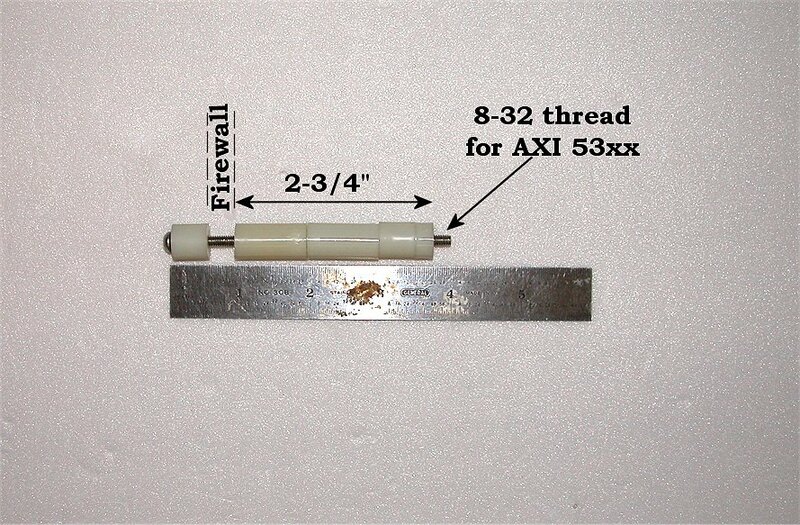 This left 1/4″ of threaded rod for screwing into the AXI 5320 motor. 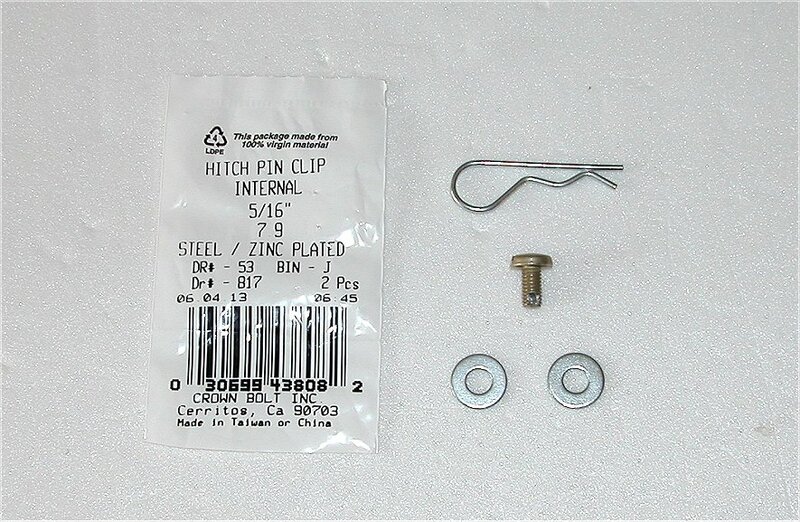 Remember to apply thread locker to this section of the screw before securing it into the AXI motor. 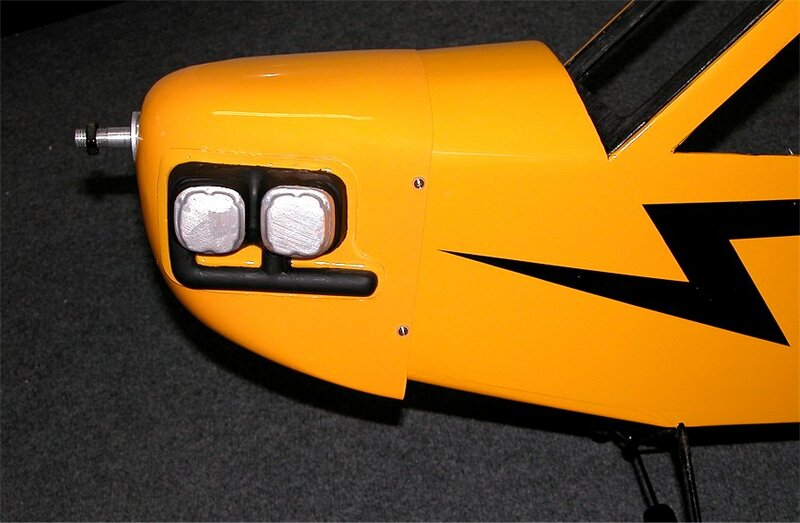 The large side opening in the J3 Cub allows for easy access to fit a screwdriver inside to tighten the four screws. I completed my motor and ESC mounting as shown above. 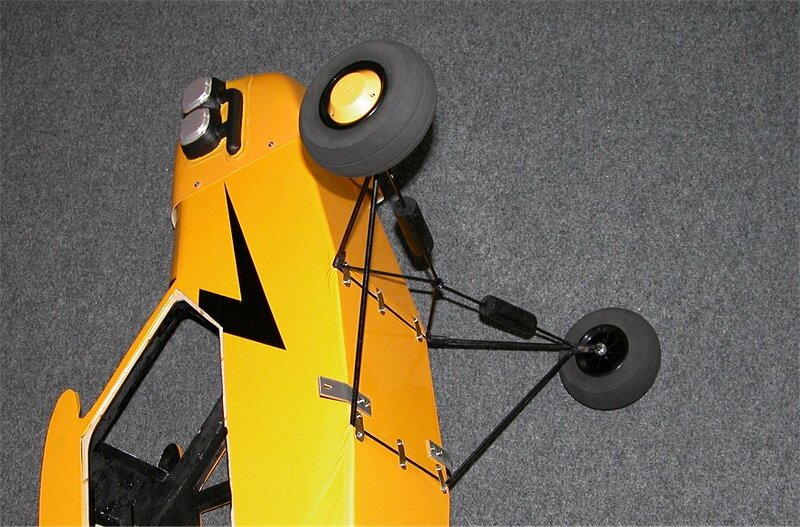 The technique resulted in a clean yet strong mount for the motor. 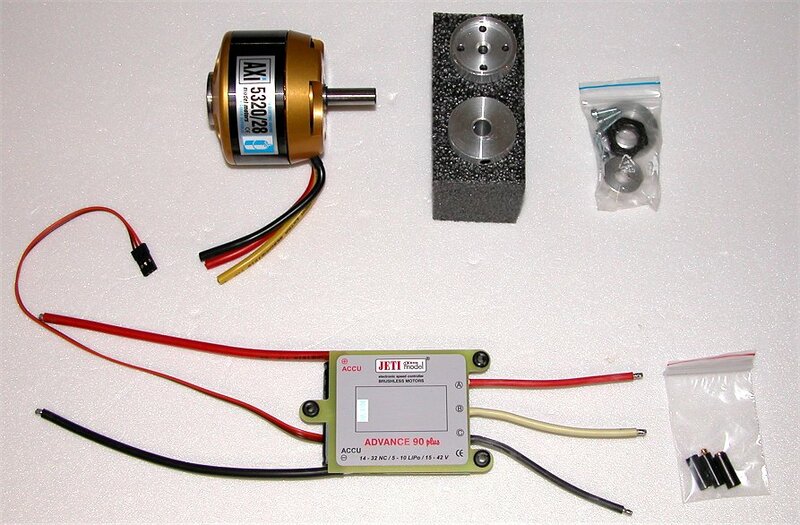 All my servos for this project are the Futaba S9001 Coreless Aircraft Servo which I’ll run on 6v from my FMA Power Force Regulator. 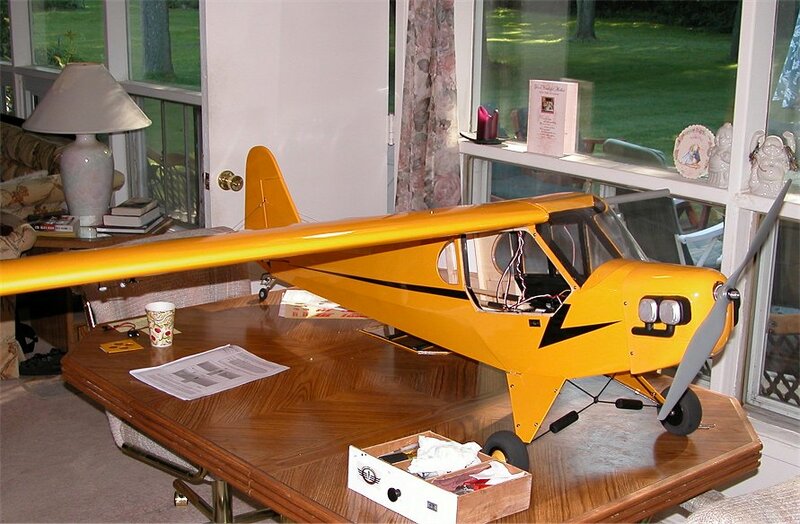 The 1/4-scale J3 Cub kit provides all the linkage hardware, pre-mounted ailerons, and, pre-drilled holes for the control horns. 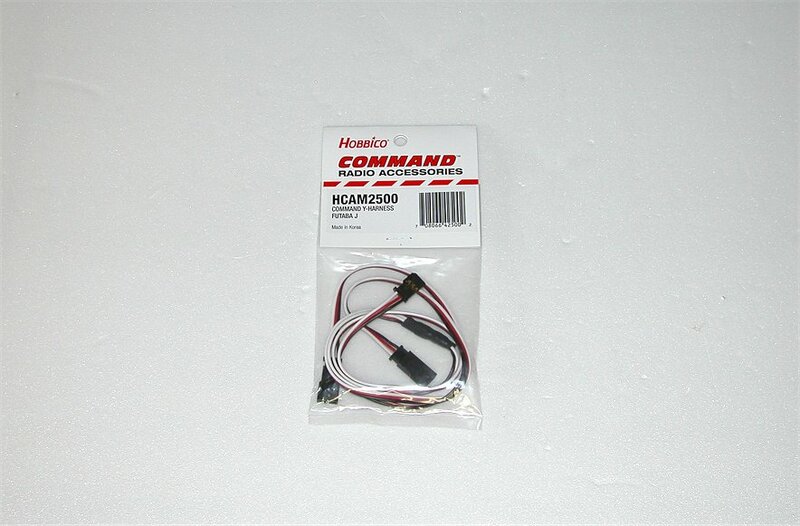 I needed a 30″ extension cable for each aileron servo. 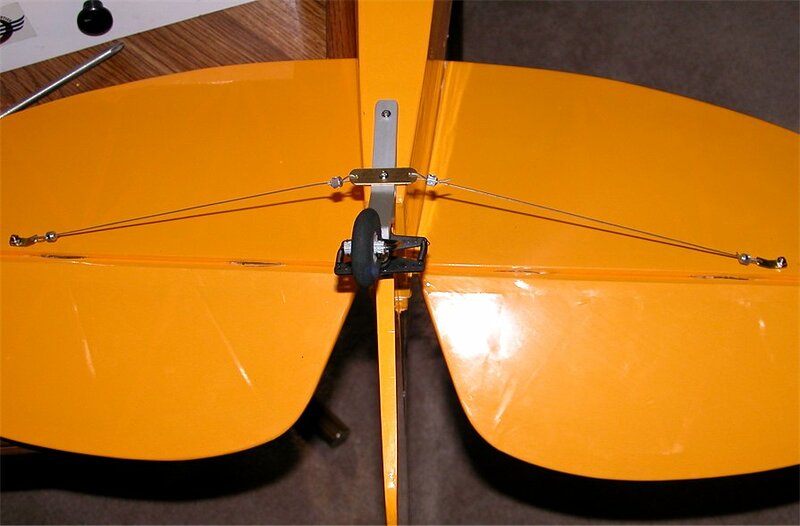 To finish up my aileron servo installation, I connected both wing halves together with a Hobbico (HCAM2500) Y-Harness and checked the alignment with a receiver and Rx. battery pack. 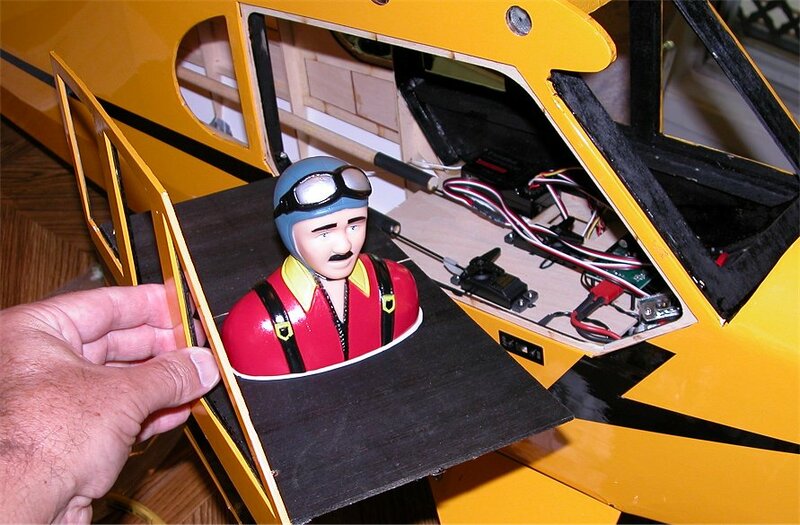 Although the cowl mounted easily, the fit with the AXI 5320 motor was rather tight so it was critical to tape the cowl in position first, while checking the motor rotation for rubbing, before drilling holes for the screws. The manifolds and valve covers were painted black and silver and then glued to the cowl with PLASTI-ZAP. I found that a spacer was needed in between the prop and the adapter backplate. My friend, Paul Weigand who is a retired machinist from Kodak, made one from my drawing as I had no 12mm drill bit. 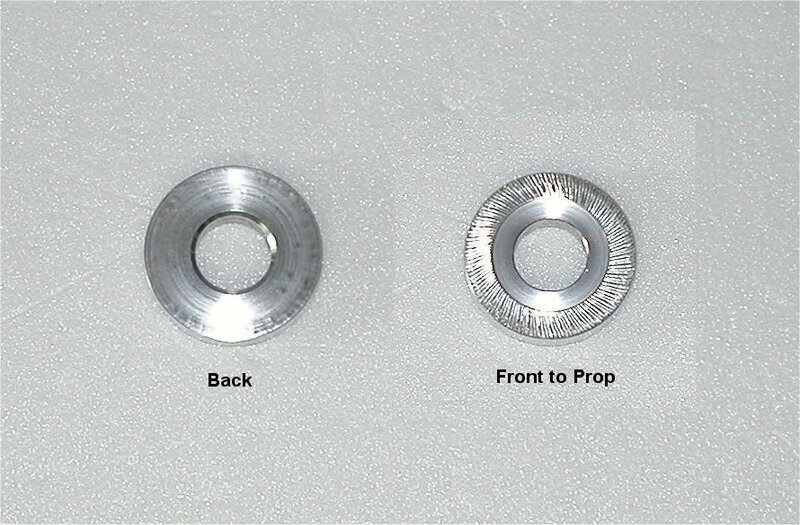 The APC 20×11 e-prop will have better clearance and the metric nut will tighten properly without hitting the untapped section of the prop shaft. After first testing my motor direction without a prop attached, I installed the APC 20×11 e-prop using the spacer made by my friend, Paul Weigand. 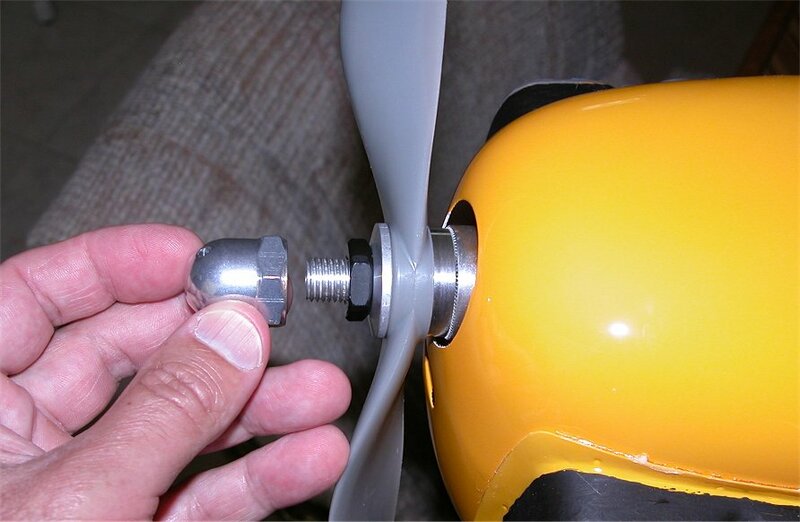 Although I couldn’t find any 12mm hubs, I thought it would look nice if I drilled out a Higley Safety Hub to fit on the end of the prop shaft. 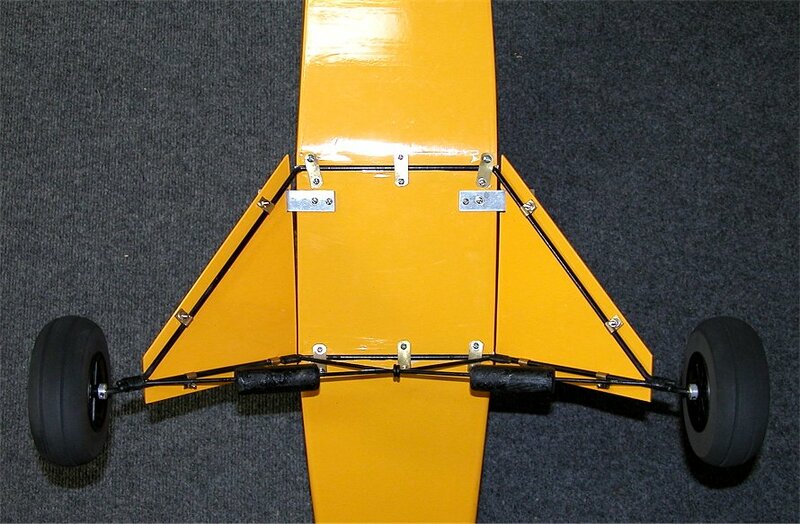 The gear mains mounted easy with the first step being the wing strut braces. The wheels are held by collars on either side and then a cap covers the outside collar. 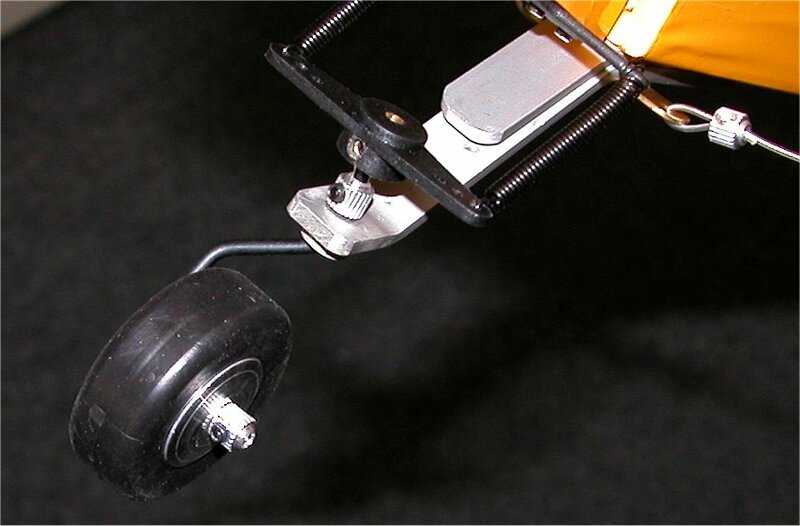 It is held by three tiny screws into the wheel hub. I ended up with two spare metal braces in the gear mains bag that wasn’t sure what do to with. 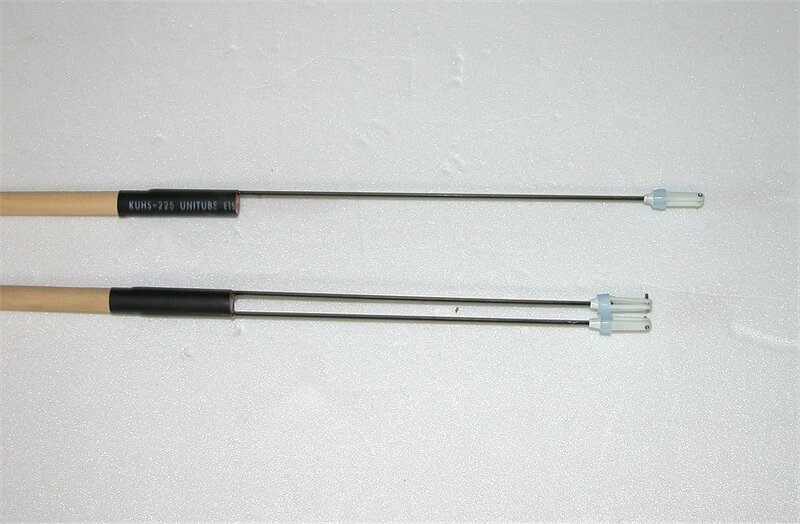 It turned out that they are used as strut supports later on in the assembly. The gear skirts were pre-cut and covered. 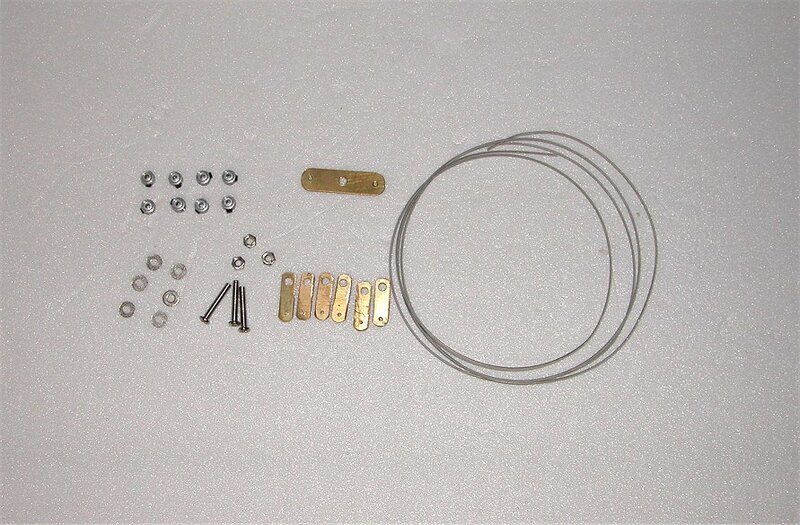 All the hardware needed to mount them comes with the kit. 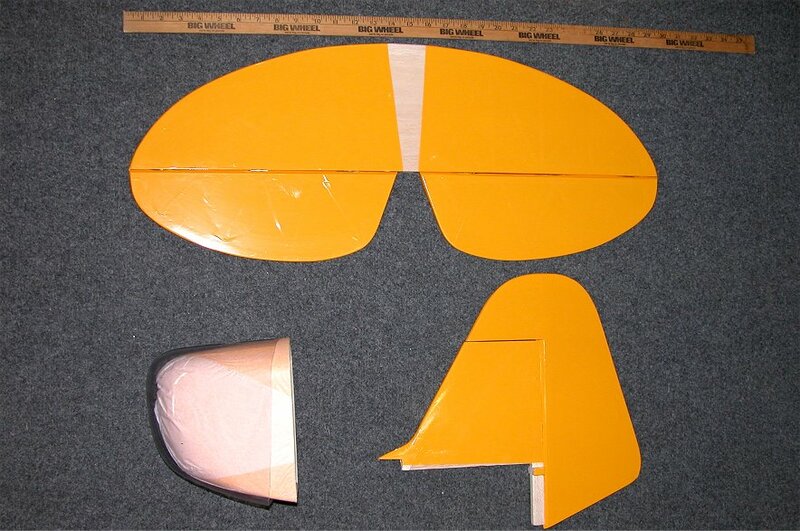 The tail section was simple to assemble as the control surfaces are pre-hinged and the covering is already cut away on the areas to be glued. 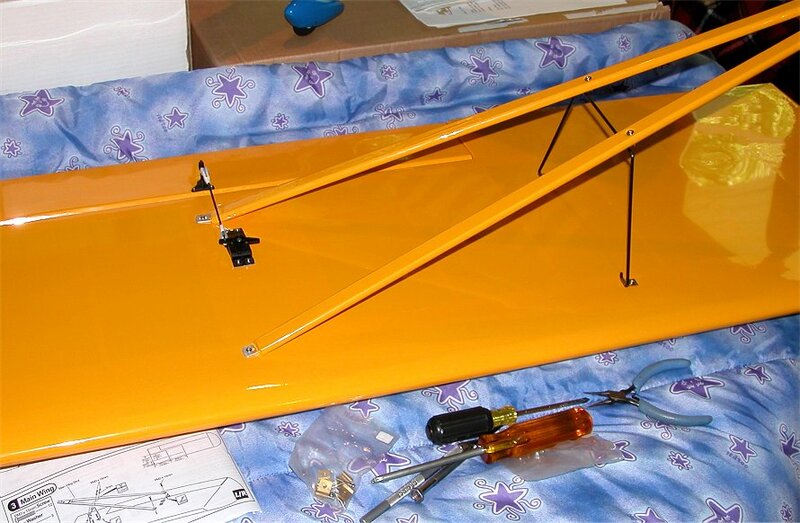 I used Pacer 5-minute Z-poxy to glue the horizontal stabilizer in place and then found it easier to use thick white glue for the vertical stabilizer. The incidences were checked and I needed no shims for correction. 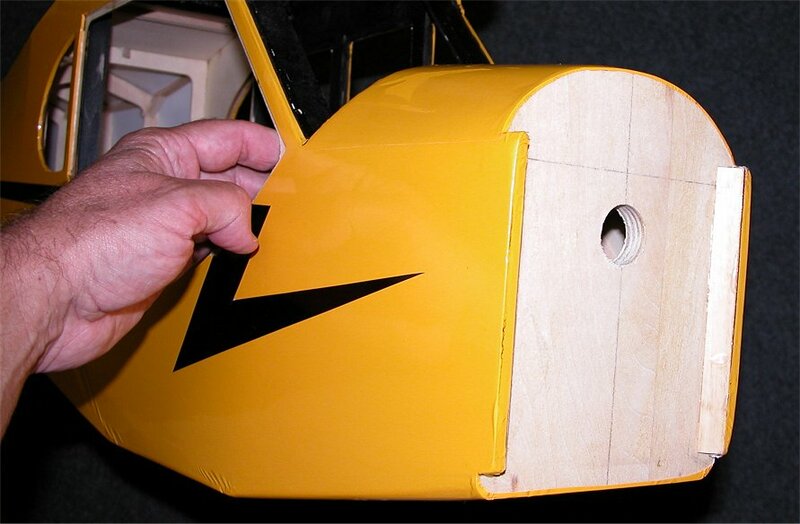 The scale decals were applied to the assembled tail. 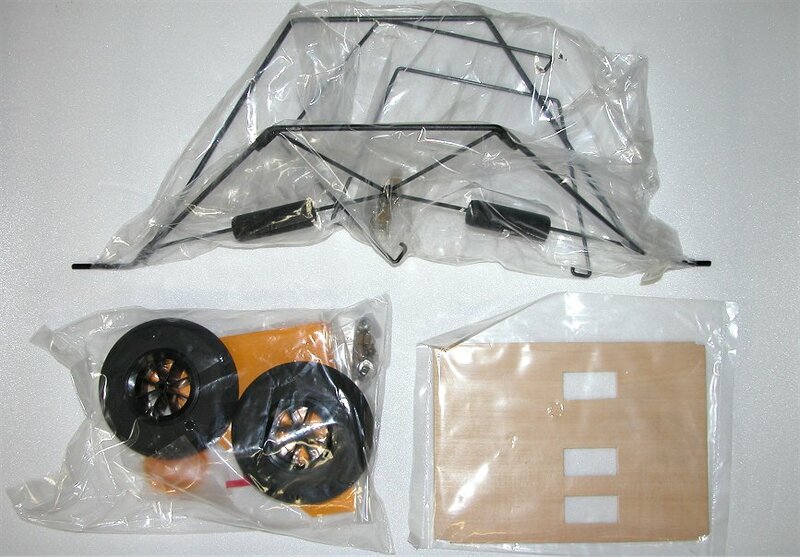 The stock tailwheel assembled easily and all the parts were in a separate bag with the instruction step printed on the bag. I needed to shorten the supplied springs by cutting off about 1/3 of the length. 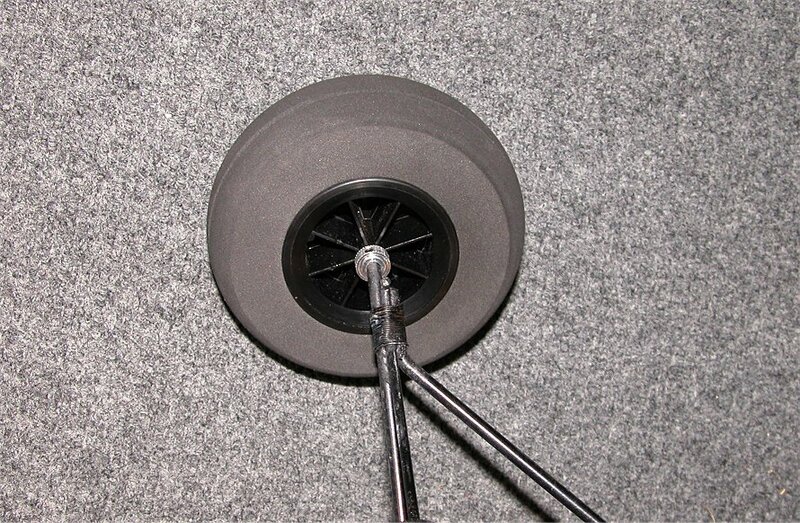 If the stock foam wheel is not robust enough for the weight, I usually replace it with a Dubro rubber tailwheel as I am not a fan of foam wheels on models this large. The tail brace kit comes in its own bag with the instruction number on it from the manual. 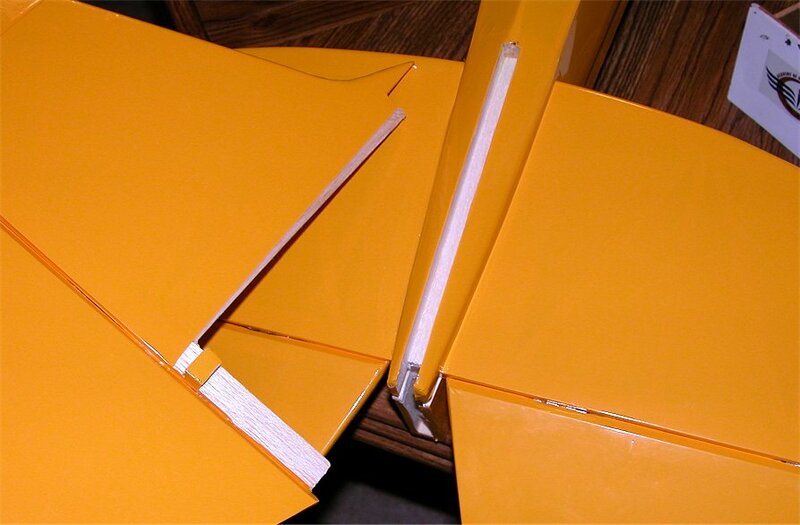 The tail already has pre-installed metal sleeves so you only need to cut away the openings. 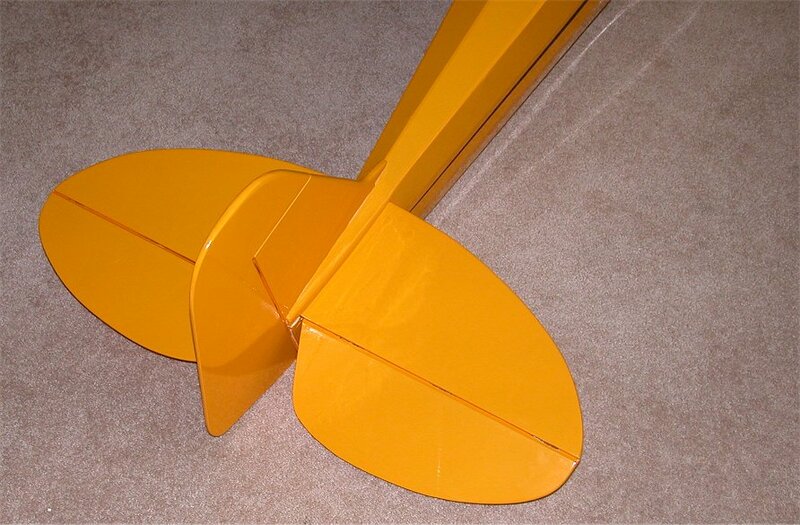 The plastic-coated steel wire supports all four quadrants. The linkage was very easy to install. 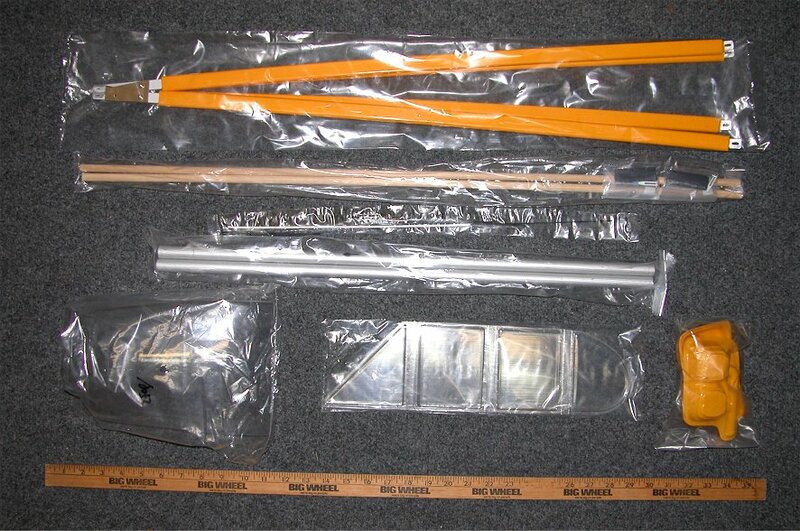 All the parts for the rudder and elevator linkages came in their own bags. 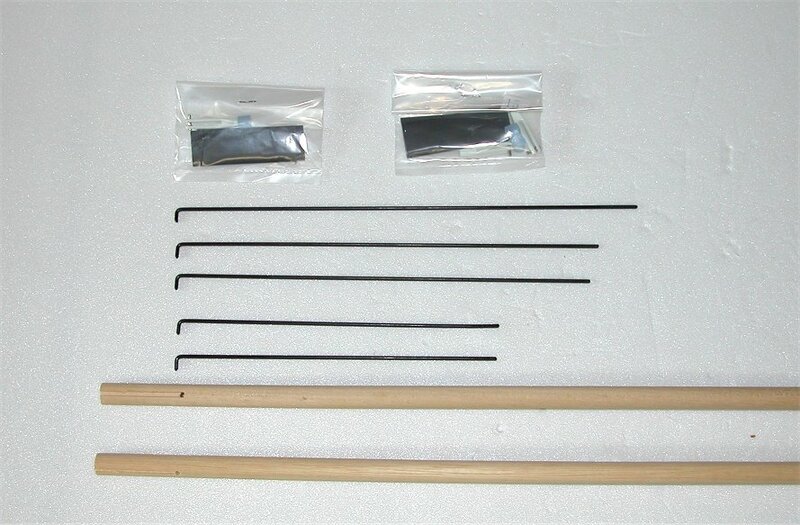 The wooden dowels and metal rods were pre-cut and pre-bent for easy assembly. 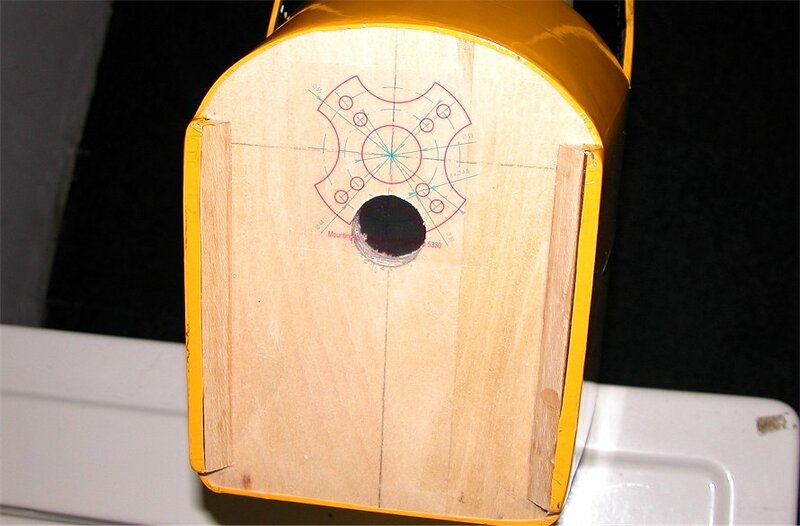 The pre-drilled holes in the control rudder and elevator halves were marked with pinholes through the covering. This provided perfect alignment for the control horns. My only change from stock parts was to replace the supplied quick links with Dubro E-Z links. 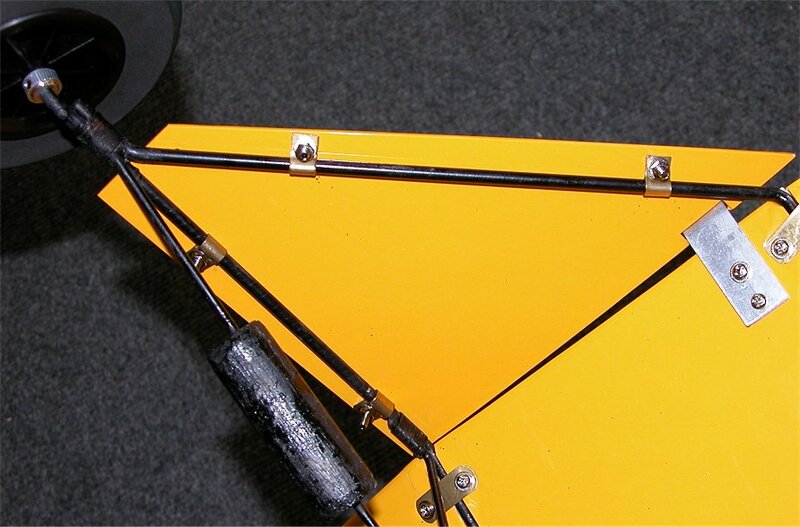 The E-Z links cannot slip as the metal rod is bent 90 degrees through the servo arm and securely held in place. 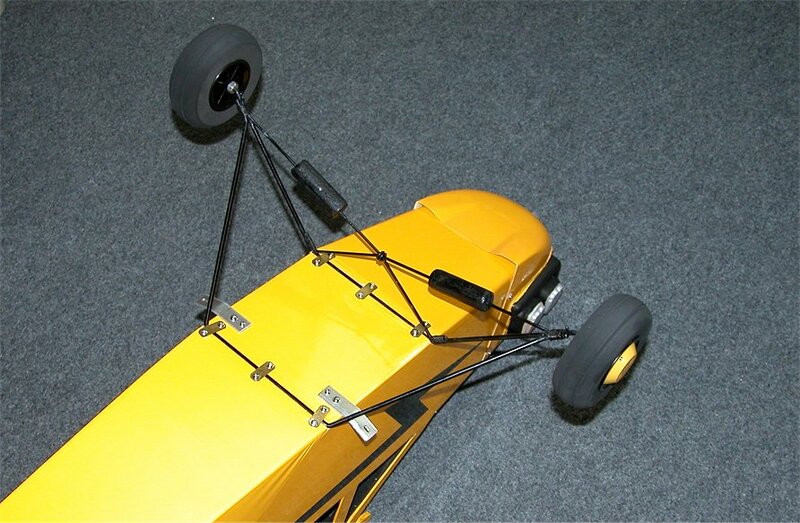 There is no need to have both ends of the linkages adjustable. 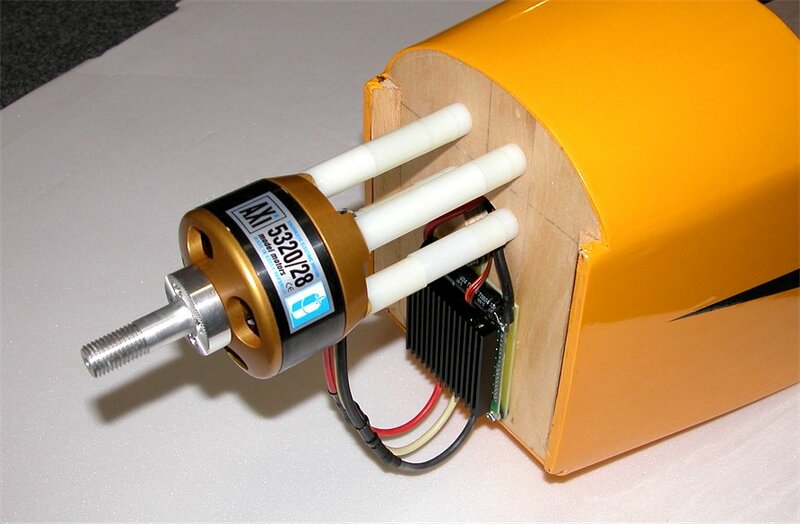 I ran the antenna wire from my Futaba R127DF 7-channel receiver into a plastic tube (not supplied) and taped it into the rear of the fuselage inside. 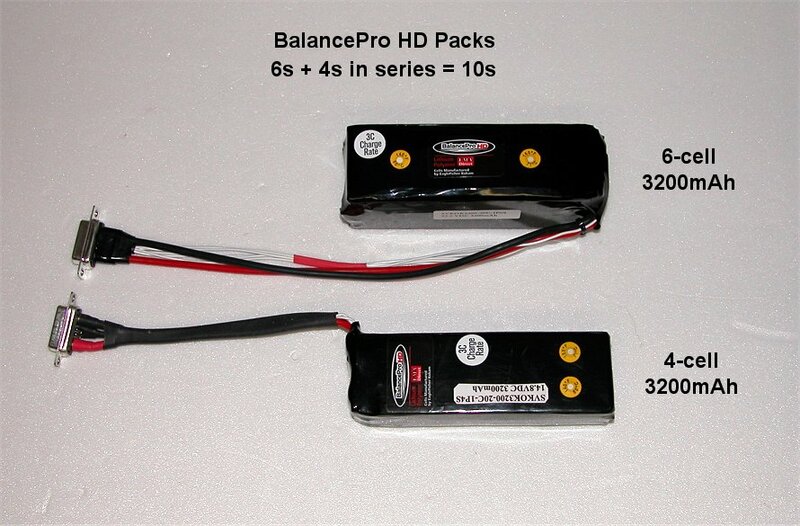 To power the AXI 5320 motor, I am using two BalancePro HD packs in series. The 6s and 4s packs are combined to create a 10s pack with a 3200mAh capacity. 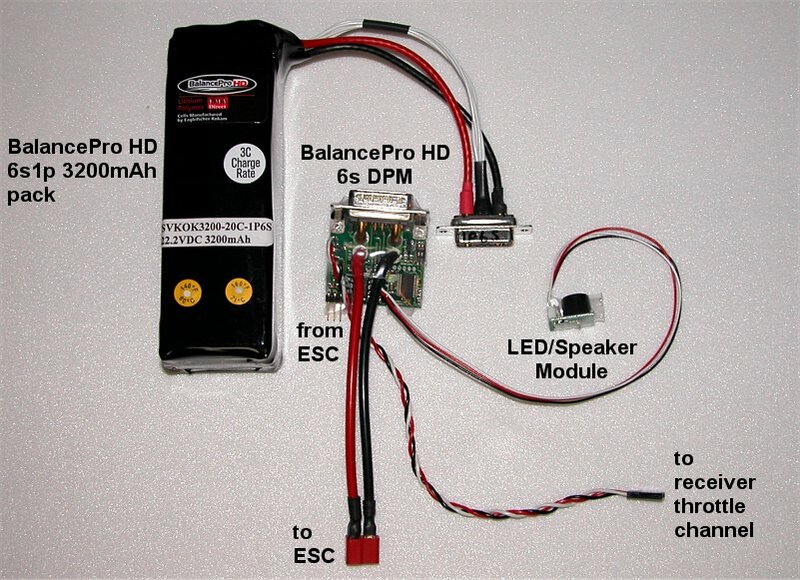 The diagram/photo shows the hook-up for a single 6s BalancePro HD pack using the Discharge Protection Module (DPM) and the optional LED/Spkr module. 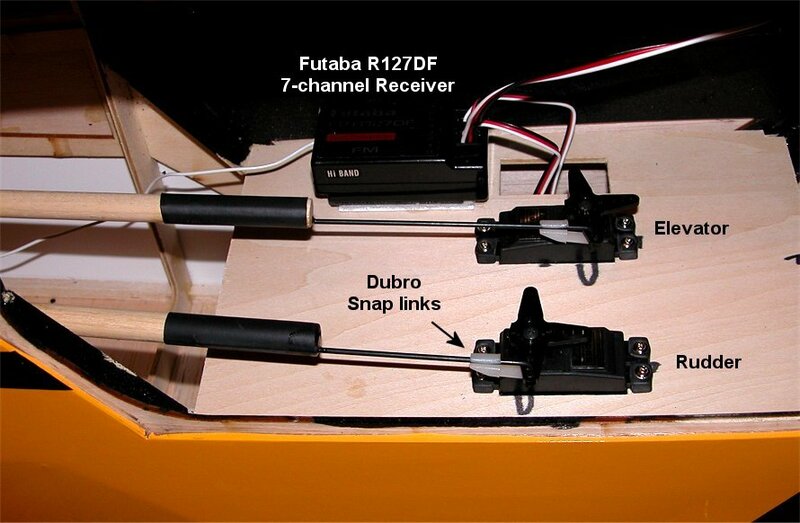 The DPM also connects in-line with the receiver throttle channel to ESC signal. This allows the DPM to monitor the throttle setting and pulse it if any one of the cells in the pack goes below the danger threadhold that can damage the pack. 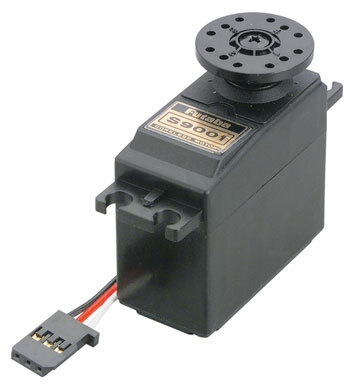 Optionally, the DPMs can be used as an alarm-only feature by monitoring the receiver throttle channel using a “Y” adapter but not connecting the output to the ESC. In this alarm-only mode, the optional LED/Spkr modules will sound if a low-voltage condition exists on any cells in the Lithium pack. 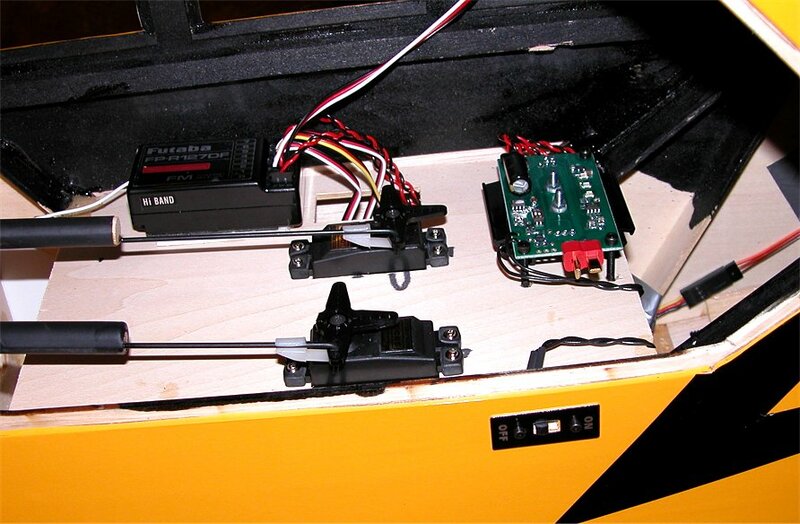 For my 10s setup, the DPMs simply daisy-chain together by connecting the power output lines in series and routing the receiver throttle channel through one DPM and then the other DPM. The last DPM in the daisy-chain gets connected to the ESC. 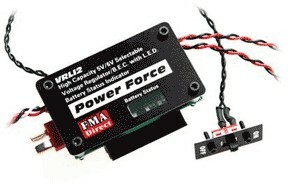 For my servo and receiver power, I’m using a Power Force Regulator from FMA Direct set to 6v. 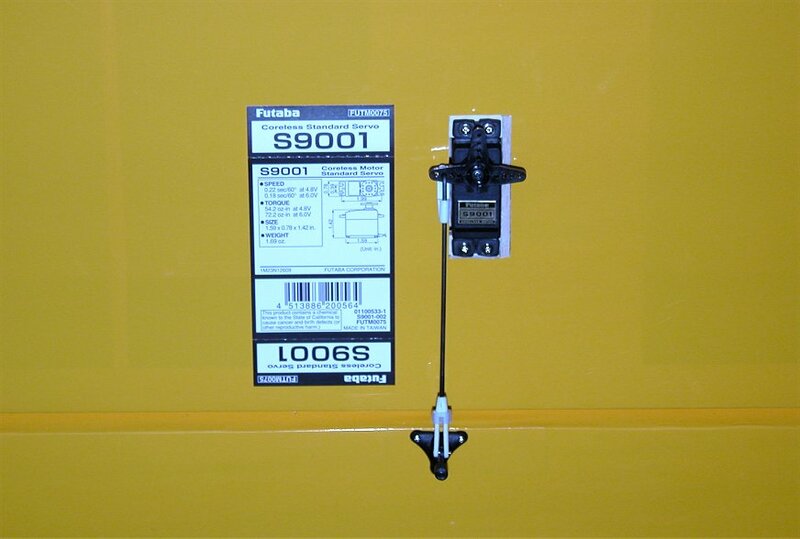 This device eliminates the need to keep a seperate receiver pack charged, has a fail-safe On/Off switch, and can handle the higher current needed for my heavy duty servos. 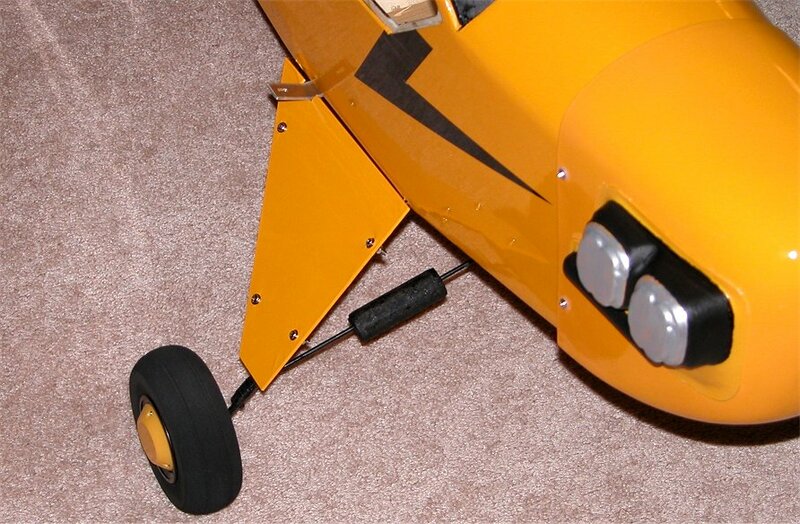 The On/Off switch has a flush slide switch that I mounted on the side of the fuselage with the supplied plate and hardware. I powered the regulator from the DPM connected to the 4s BalancePro HD pack. Note that this pack must be connected to the ground side of the wiring and the other 6s pack is wired in series to power the Jeti 90-amp ESC. Optionally, you can also supply the Power Force regulator with a separate 2s, 3s, or 4s Lithium pack or 5-12 cell NiCd/MiMH pack. The instructions for the pilot tray were quite sparse so I decided to make some simple modifications to better suit my electric conversion. I wanted the pilot tray to be easily removeable to better access the batteries for recharging. I cut one of the two trays so that it could slide in and out. I then used the cut away sections to strengthen the assembly underneith. 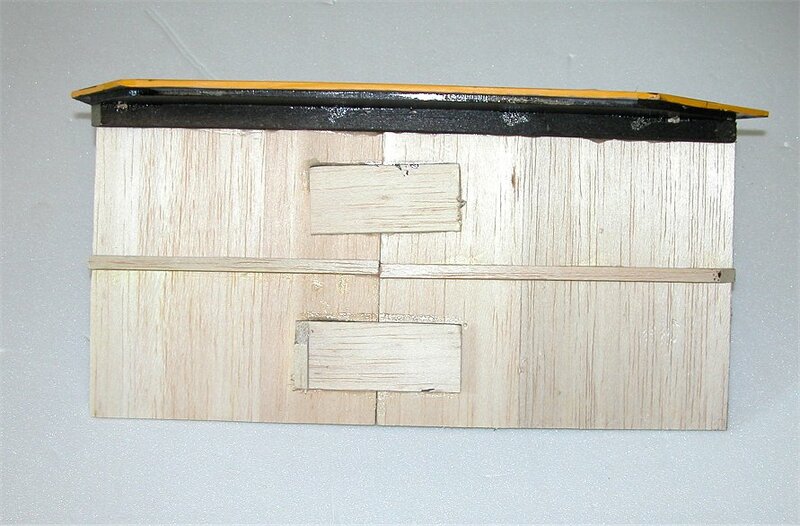 The trays were glued with 5-minute Z-poxy and also screwed into the channel of the main hatch door. 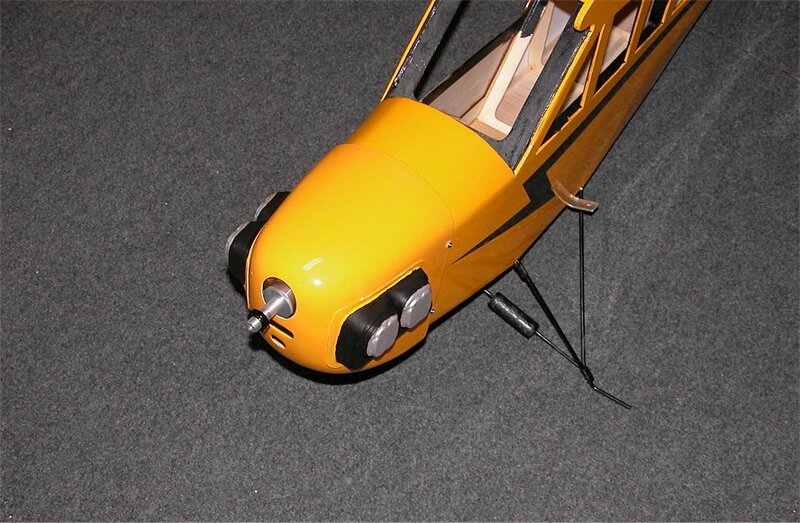 Since I planned to test fly the Cub the next day, I used the stock screws to hold the pilot tray in position. 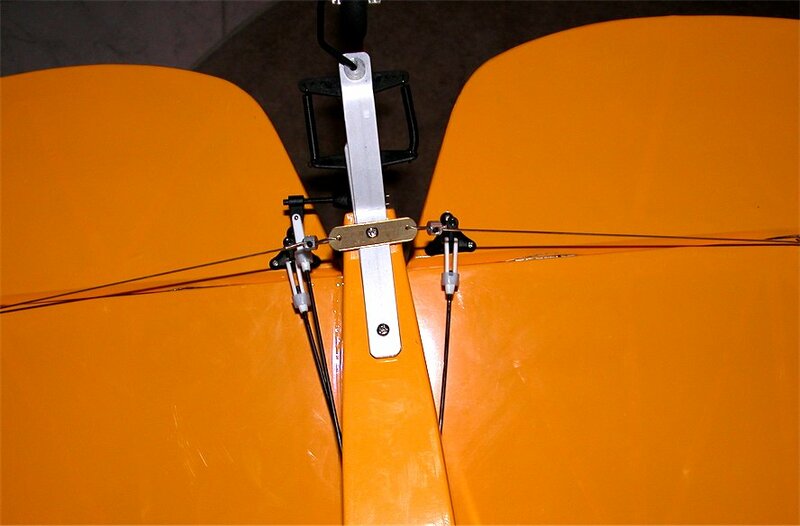 See my quick release modification using servo arms later in this review. The tray rests on a channel on the inside of the left window area. 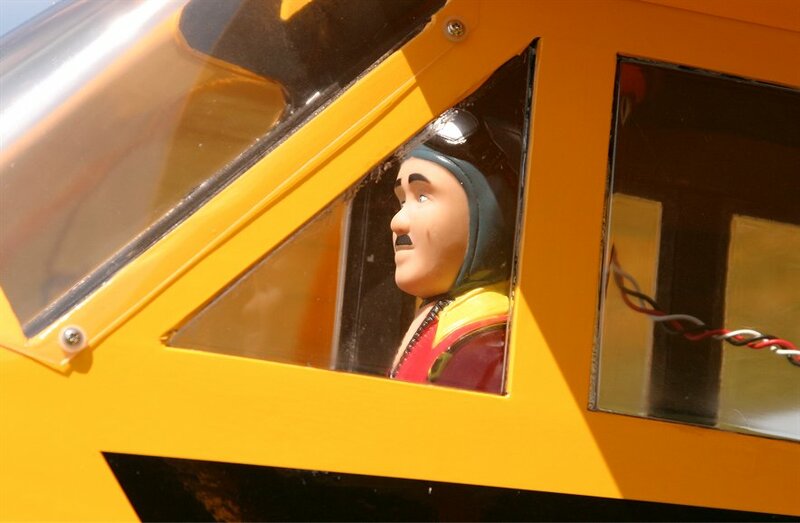 The rubber pilot is pre-painted and comes with a double-sided sticky foam pad to hold him on the tray. I used some medium CA to help hold the pad to the wooden tray. 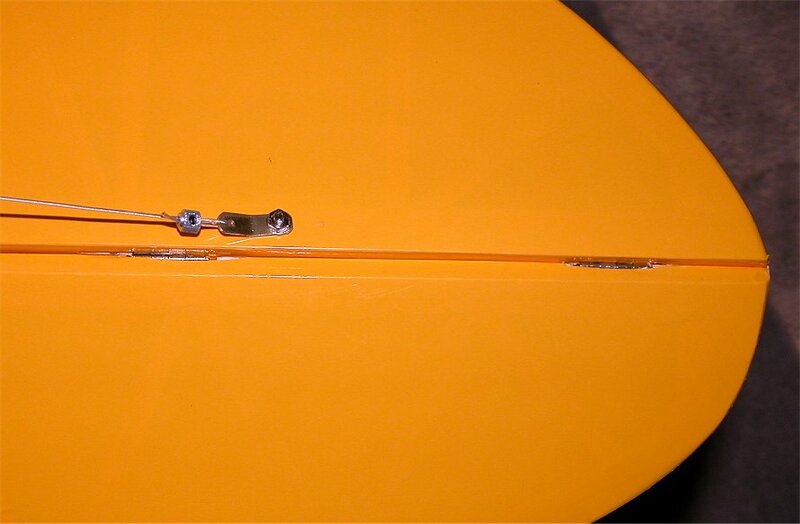 Note that the front windshield is held in place with supplied screws and rubber inserts to protect the plastic. 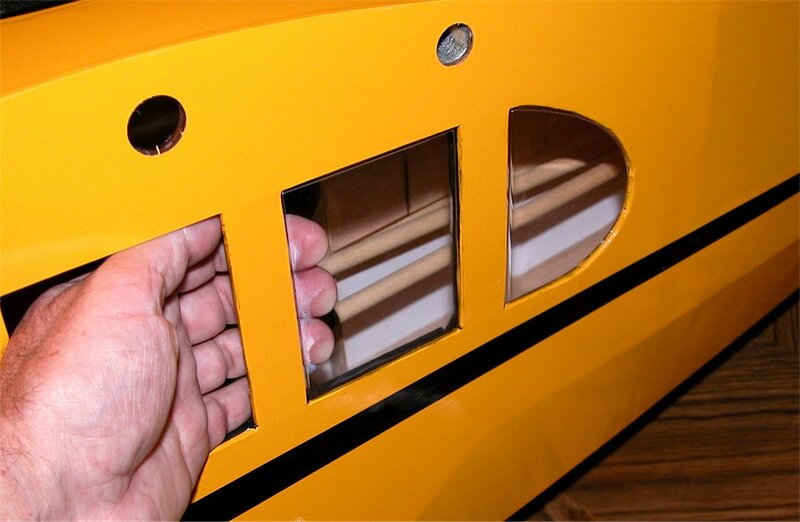 The windows came in the kit as a single piece for each side and only needed to be cut on one line to separate them. I glued them in place with Pacer POLY ZAP(tm). Designed to work on plastics, delron, polycarbonate, nylon, and rubber…is is ideal for clear canopies and windows. It dries clear and is non-fogging when kicker is not used. 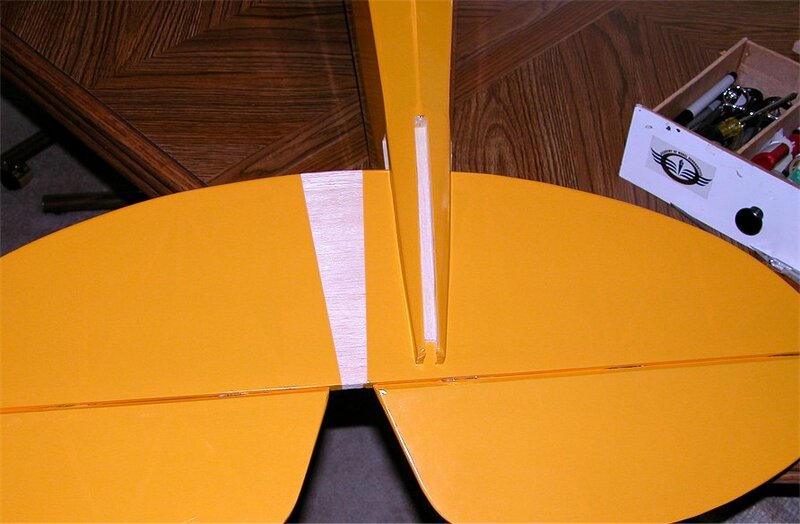 The wing assembly is straightforward. 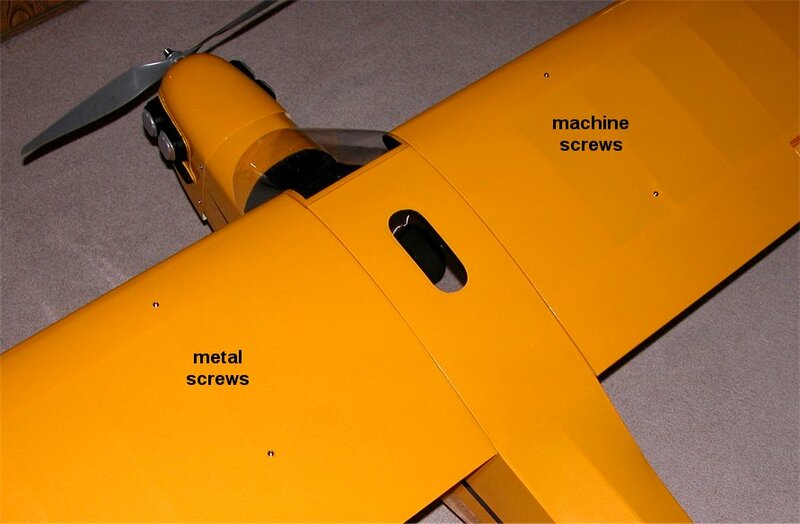 Two aluminum rods are inserted in the right wing first and held with machine screws in pre-tapped holes. 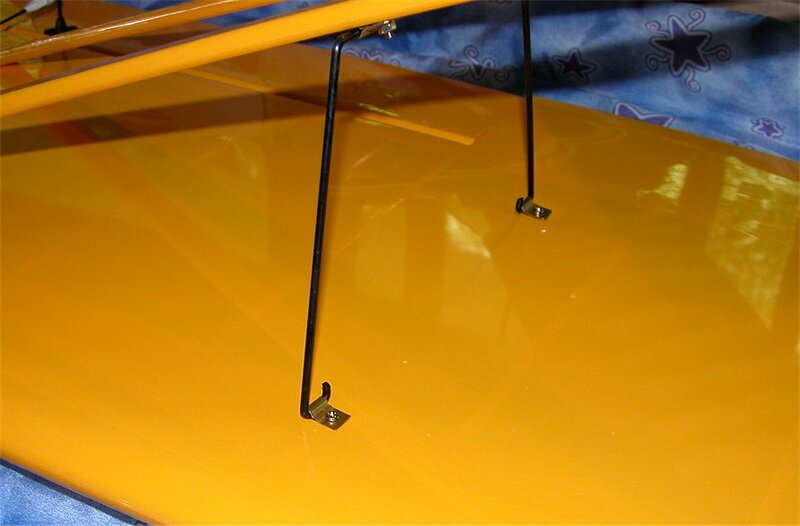 Once the wing is in position, the left side is held by drilling holes into the aluminum rods via the pre-drilled holes in the wing. 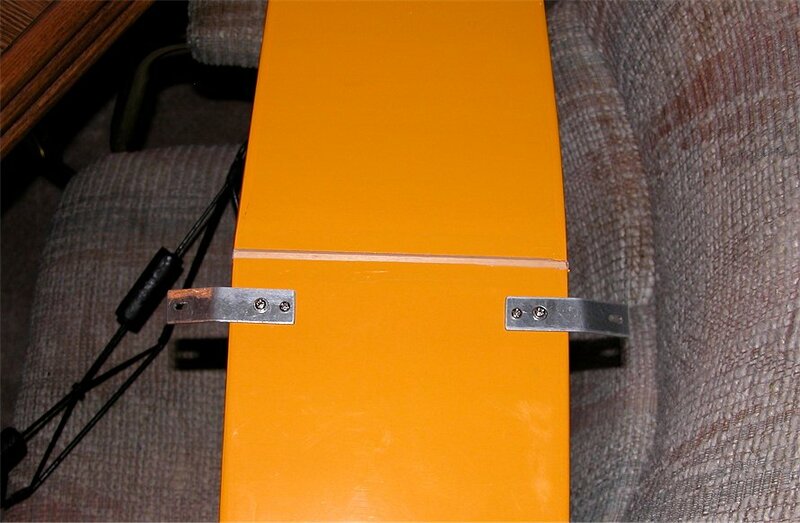 The left wing half is then held by sheet metal screws. 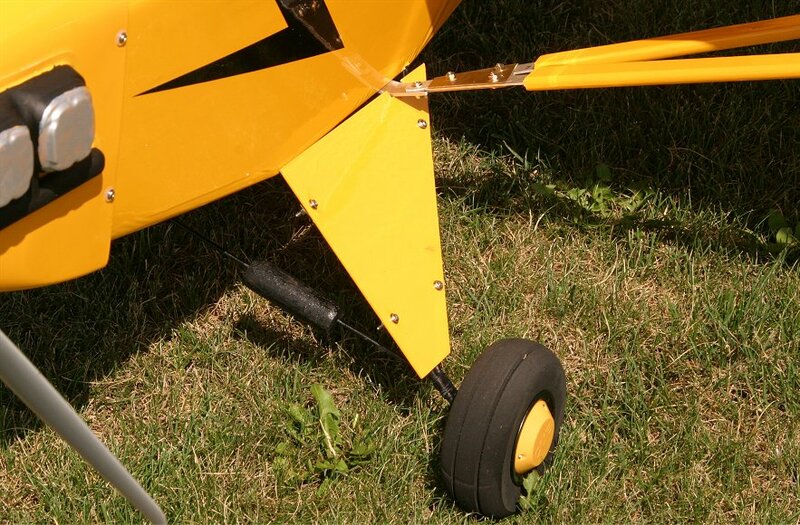 To dissassemble, you remove the machine screws in the right wing half. It was rather funny as I hesitated and squinted at the first part of the large callsign decal. 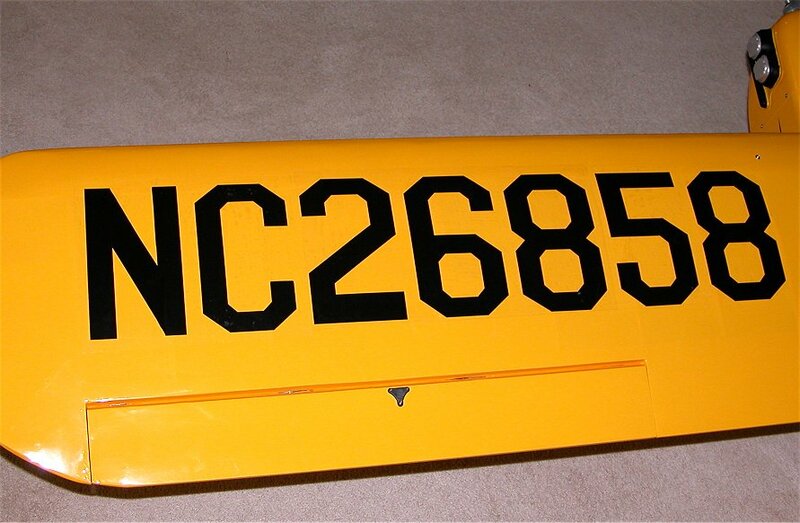 I was about to apply the large decal to the wing, leaving the others for after the maiden flight, when I noticed that the “N” in the plane I.D. was a mirror image. 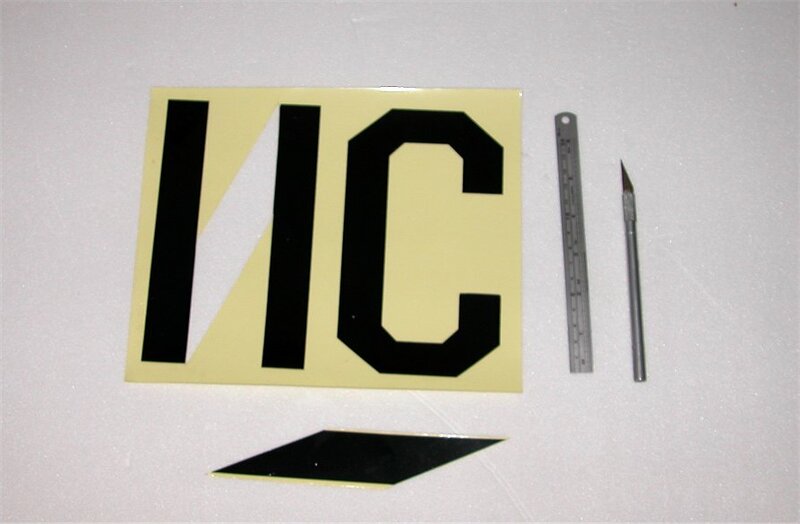 I cut out the center portion of the “N” and then applied the decal. Once applied, I cut the correction from a piece of black sticky-back Monocote trim sheet that I had from a previous project. 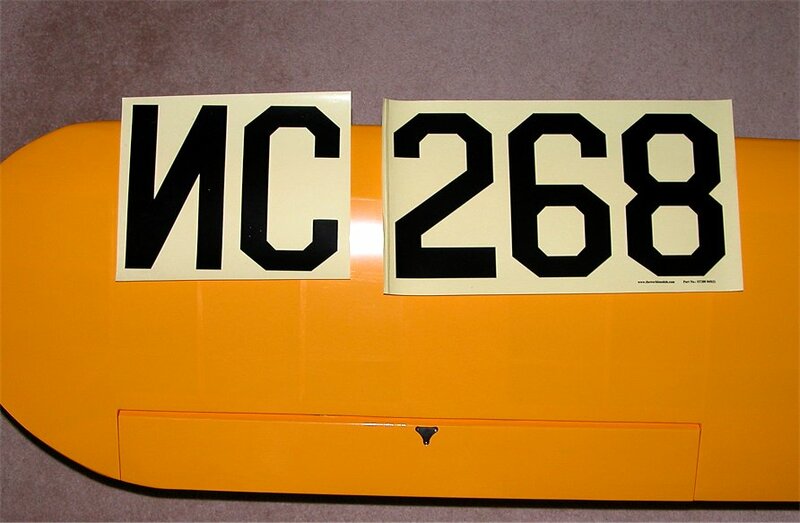 I notified Fai Chan of Airborn Models (the U.S. distributor for World Models) and he found that his new stock had the corrected decal. Apparently my model was one of the last from the previous production run. The final step of my assembly was to attach the struts and their supports. The design of these struts were very good and proper for a plane this size. 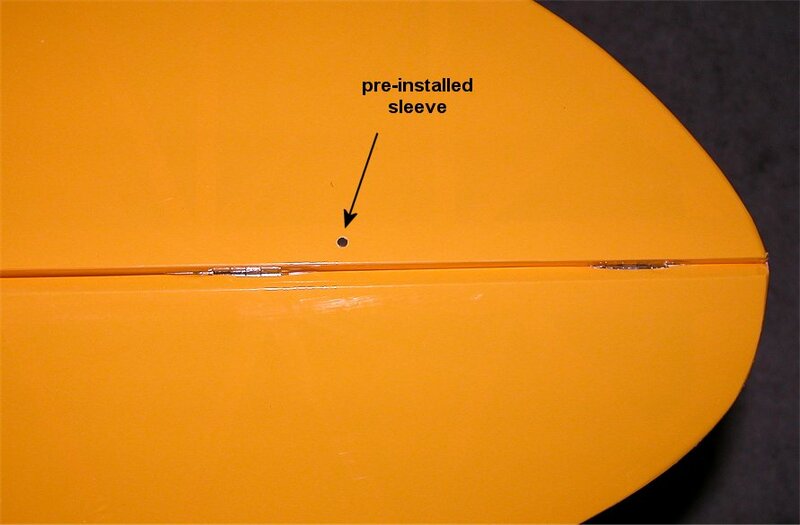 All the wing inserts were pre-installed so you only needed to find the pin holes in the covering. 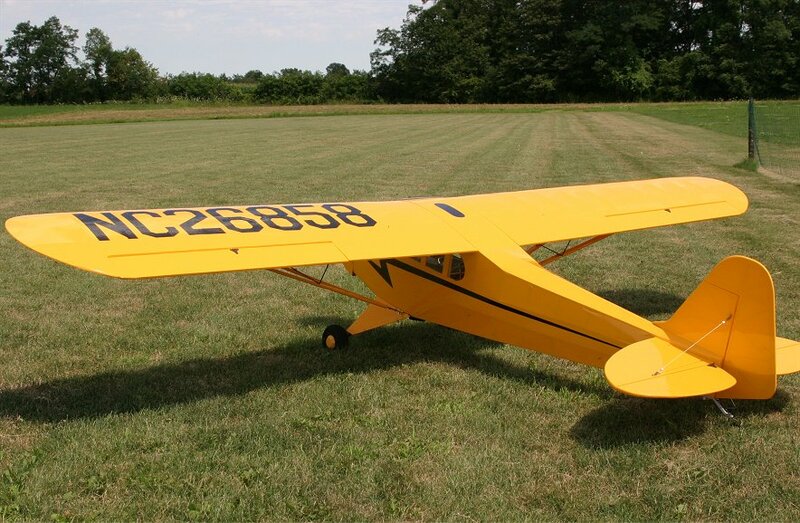 My only change after the maiden flight will be to make the attachment to the fuselage a quick release post and pin instead of the supplied screws and locknuts. See below. 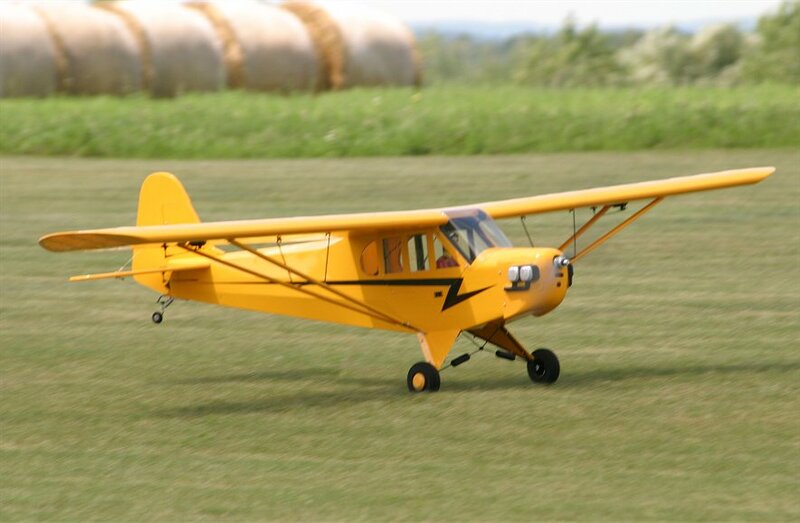 After the initial flights, I decided that the stock foam tailwheel was a bit weak for a Cub this size. 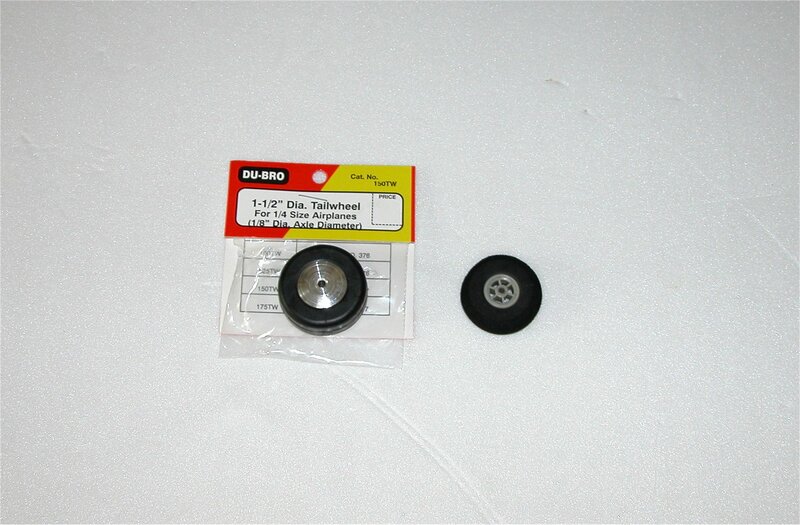 I replaced the stock tailwheel with a Dubro #150TW 1-1/2″ solid rubber tailwheel for quarter scale planes. 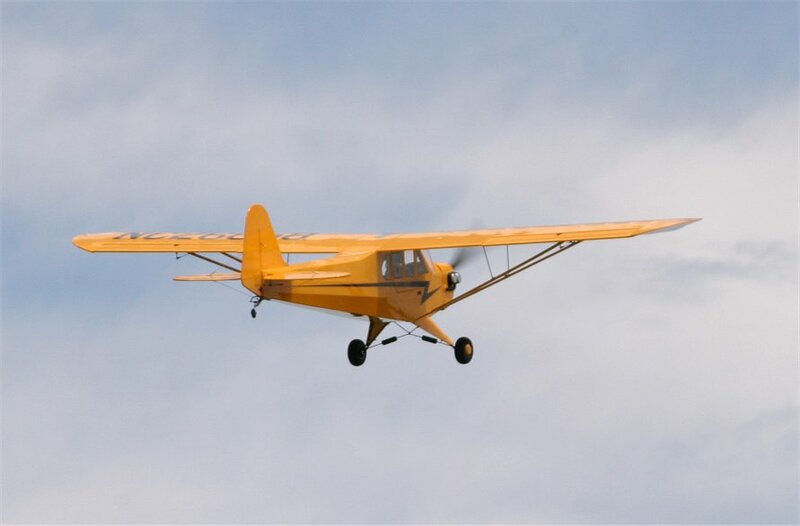 The replacement Dubro tailwheel had a slightly larger axle hole diameter but it was not sloppy so no drilling was needed. 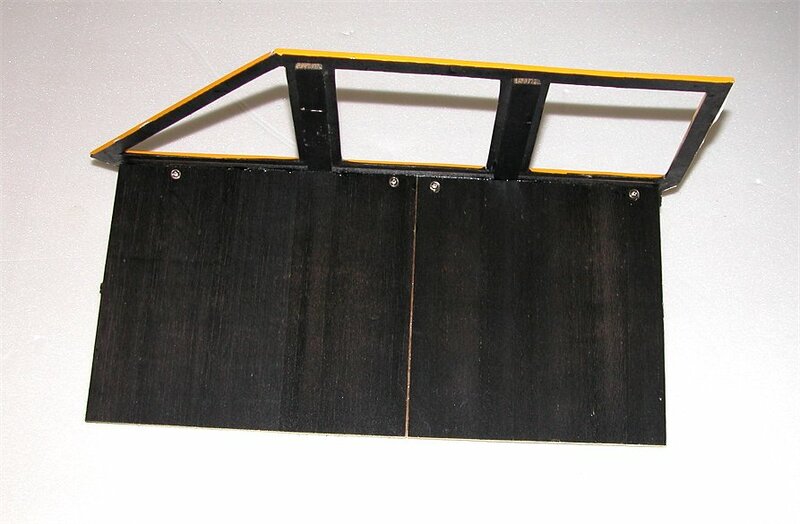 The pilot tray was more easily removeable by creating latches from cut off servo arms. 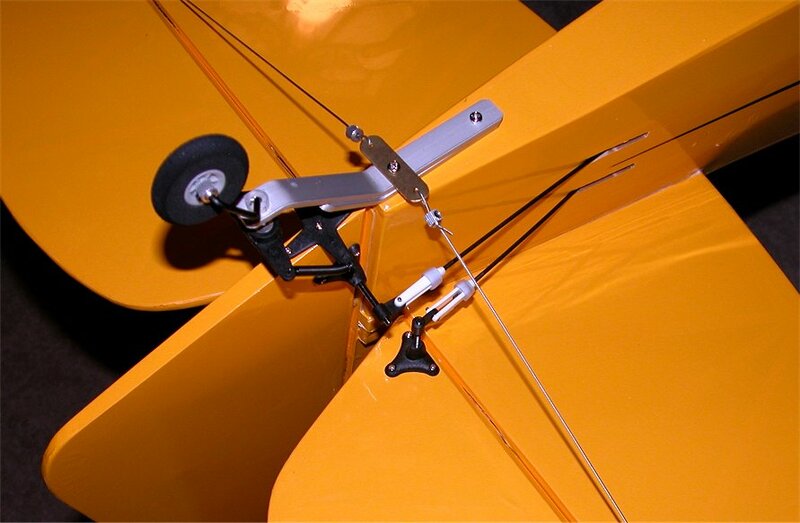 The strut screw and nut holding it to the fuselage brace was replaced with a hitch pin clip from Home Depot and a short brass screw with a hole drilled in it to act as a hitch pin. 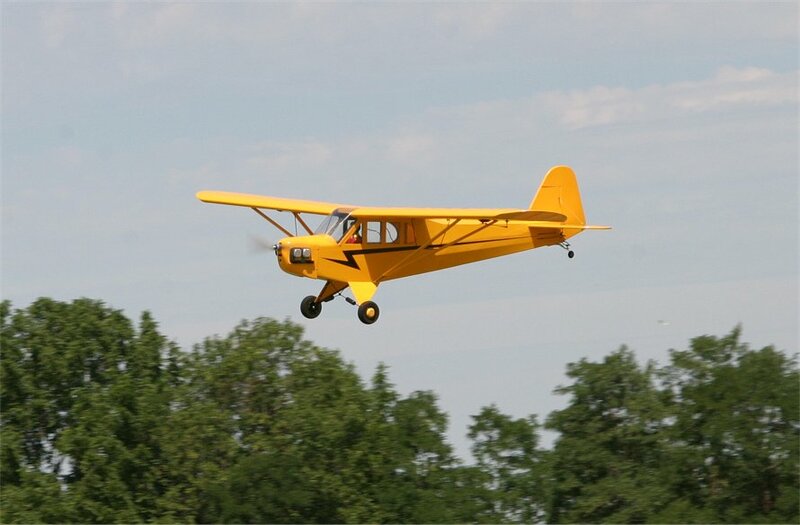 Here are some Ready-To-Fly photos of the J3 Cub. The all up weight was about 16lbs. The power system delivers 2500 watts at 68amps for about 156w/lb. Obviously, I have much more power than needed which will be seen on the second video (I made 2 of them) showing slipping and stall turns. 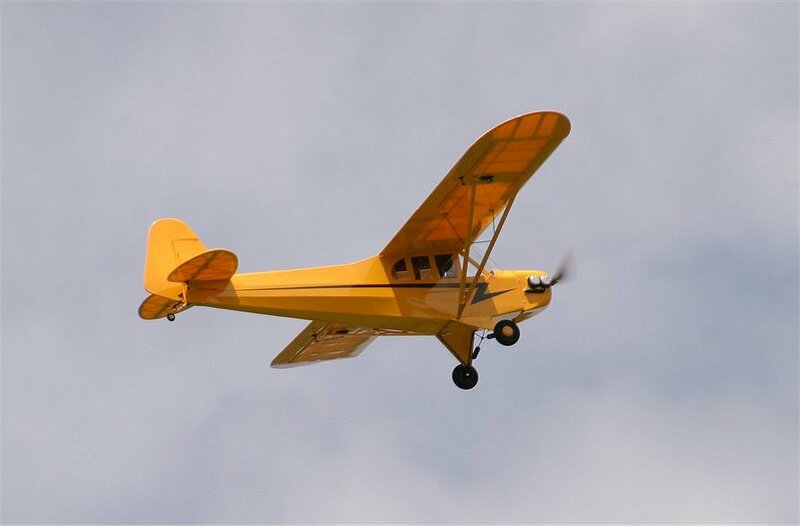 For the most part, we used 1/4 to 1/2 throttle and then throttled up to 3/4 or full for various power maneuvers. 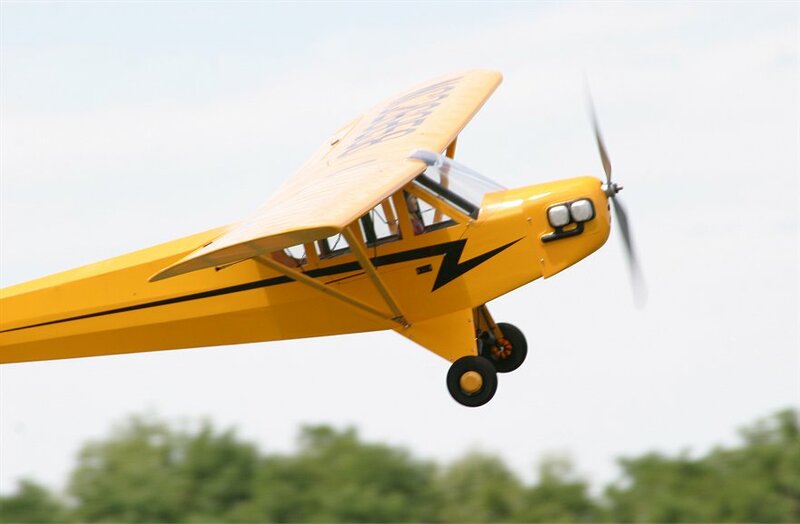 This first video shows that maiden flight of the World Models 1/4 scale J3 Cub. 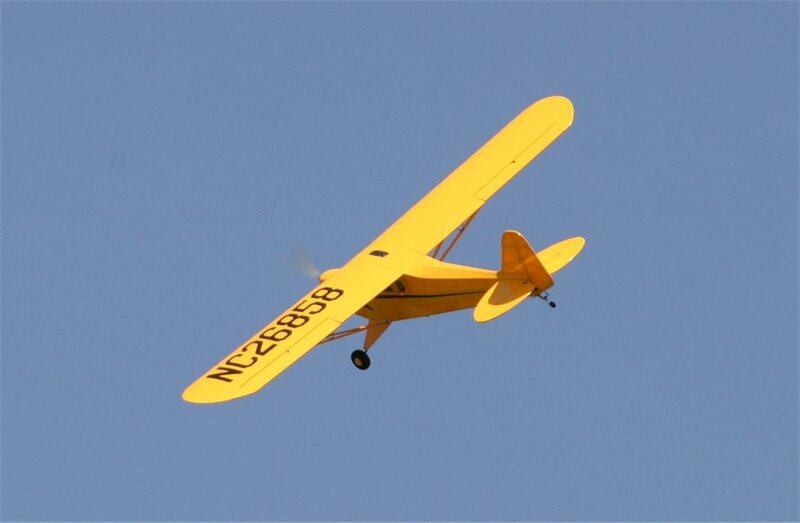 After a slight trim, it flew like a dream in 10-15mph winds. 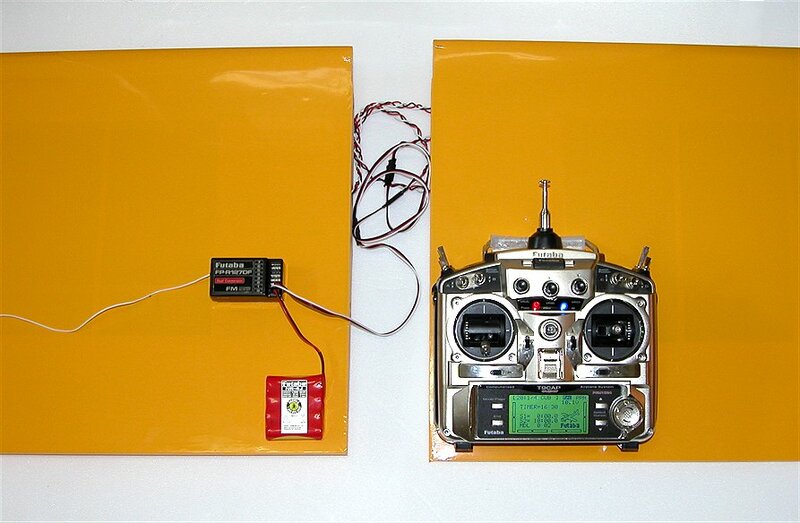 The strong power level allows for easy rolls and loops and the flight times were about 15 minutes with 3200mAh packs. 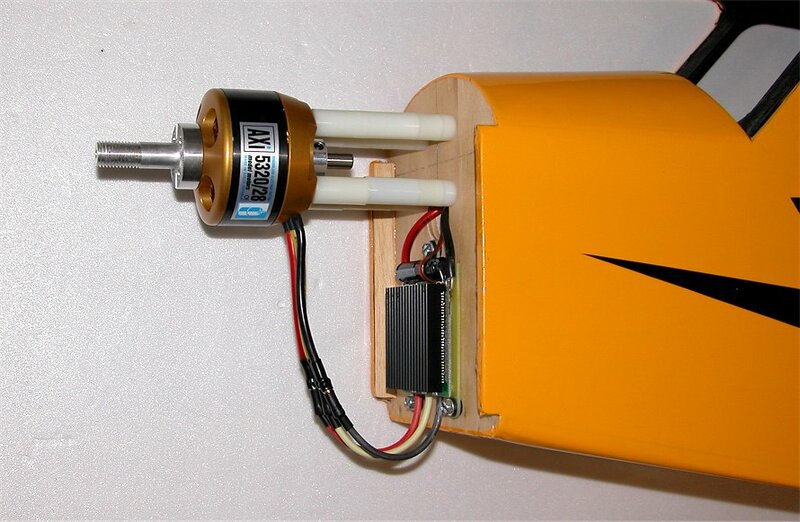 Since the Cub will fly well at only partial (1/4 to 1/2) throttle, the motor, ESC, and batteries will stay cool and last for many flights. 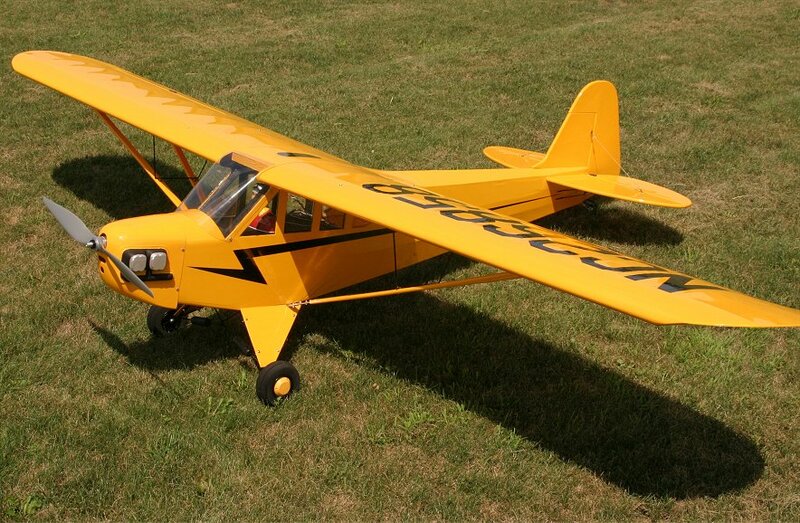 J3 Cub Electric-powered video 1. 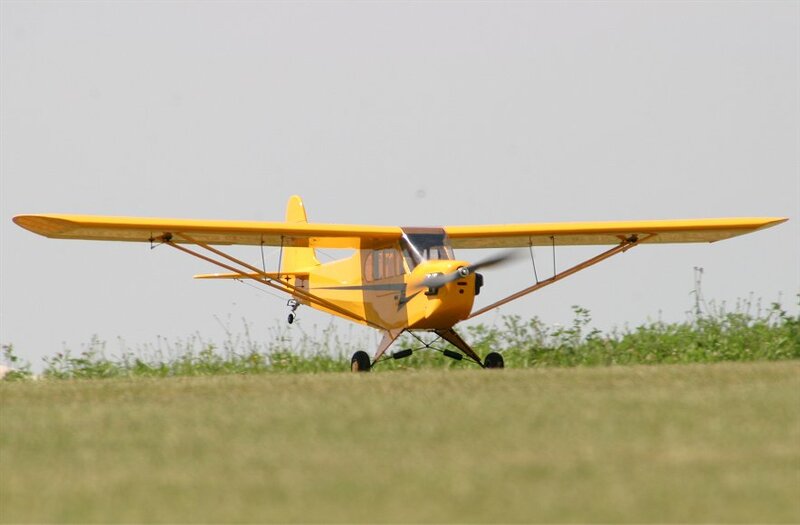 The second video of the J3 Cub shows some slipping into landing approaches at an angle and some stall turns. 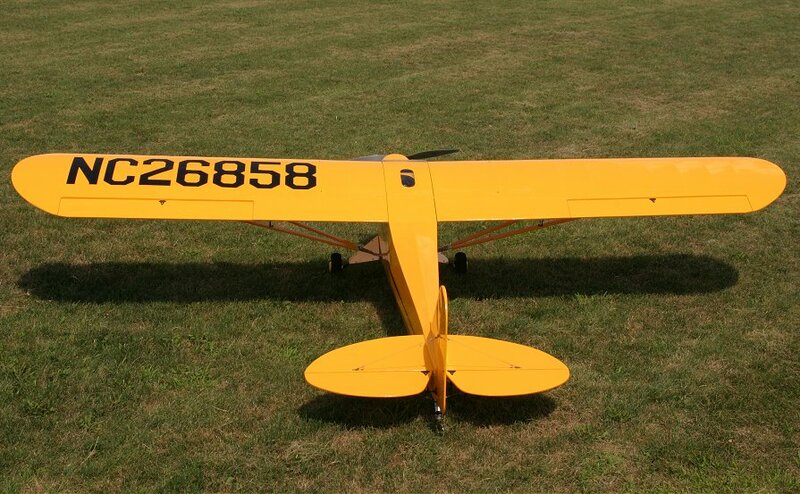 J3 Cub Electric-powered video 2. 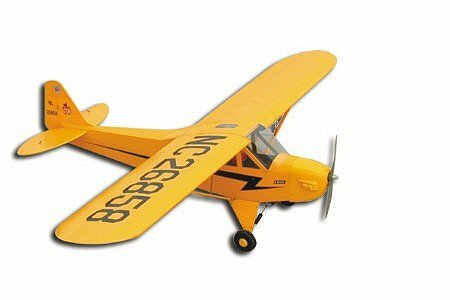 After building and testing the World Model’s Piper J-3 Cub 1/4 Scale ARF, I can see why it is the most popular 1/4 scale ARF model on the market. 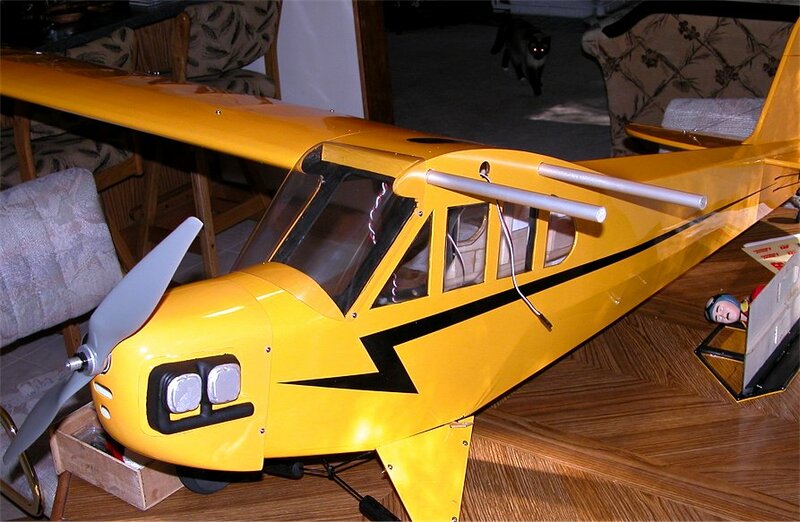 The kit was very complete, well designed, and the finished plane simply flies great! Minor modifications were done to improve field assembly and access the battery packs for recharging. 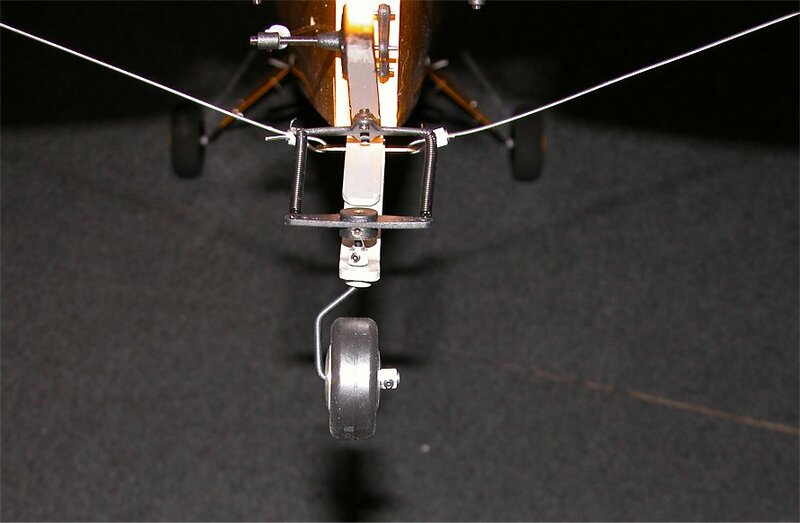 The weak foam tailwheel was easily replaced with a solid rubber tailwheel from Dubro. 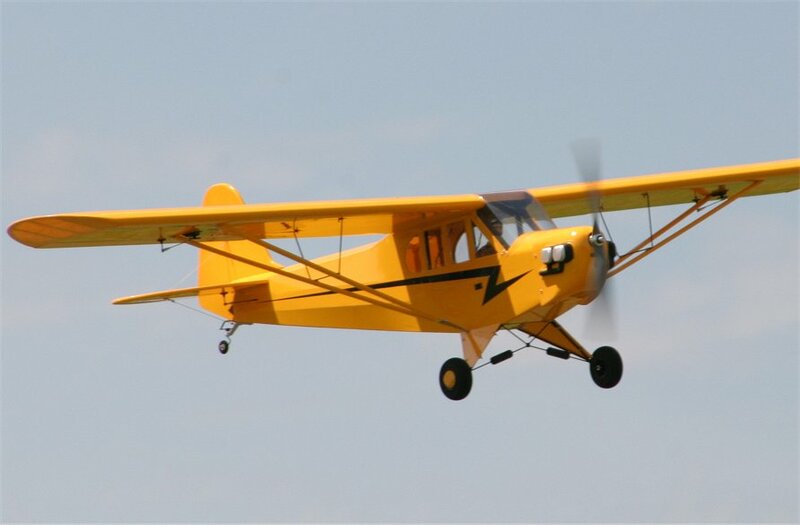 The J3 Cub is a predictable, gentle flyer that can also perform aerobatics when desired. 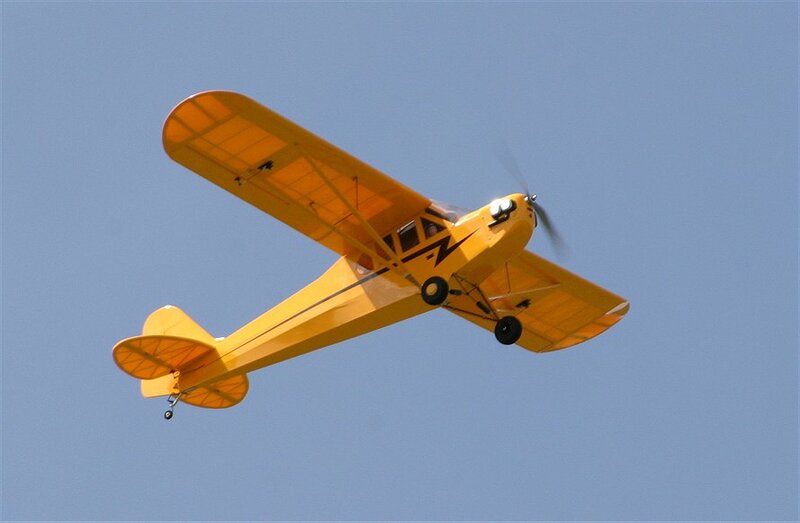 The quarter scale size is easy to see in the air and unaffected by 10-15mph winds. 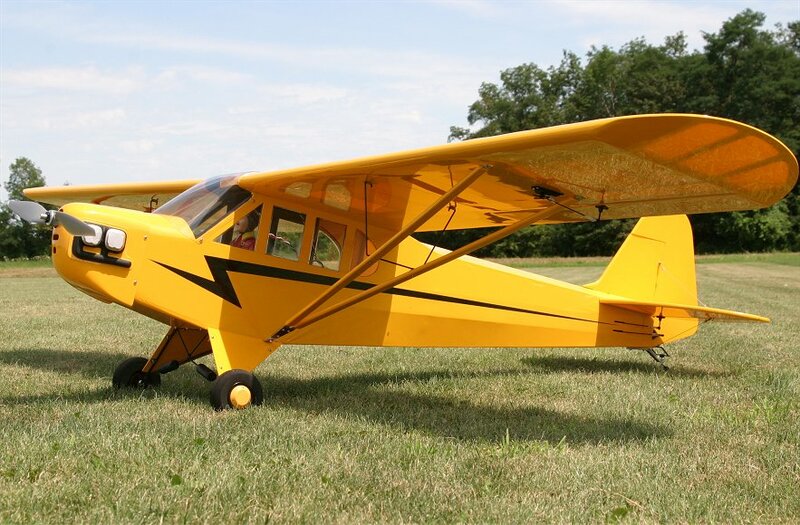 I plan to have plenty of fun flying my big J3 Cub this summer. 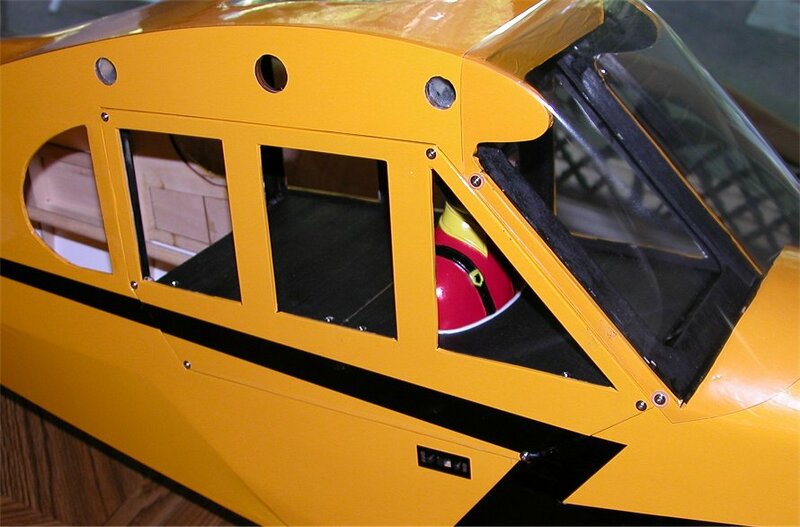 It will stay clean and fly quiet with a very capable AXI/Jeti electric power system. 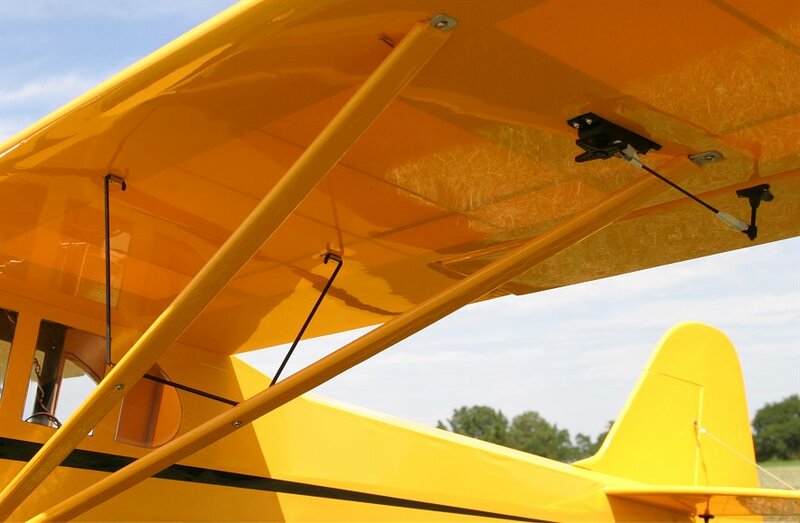 The BalancePro HD batteries and charger will keep things safe and get me back in the air quickly with 20-minute (3C rate) recharges.